What are the odds that this rare and wonderful old Sears House is still alive and well in New Orleans? I don’t know enough about NOLA to even venture a guess. Last night, I went to a favorite site (Realtor.com) and looked up “houses for sale” (single family and 50+ years old) and that brought up only a handful of listings. Apparently, there’s been a huge amount of redevelopment in New Orleans. A reporter from this area has asked me to find some Sears Homes in New Orleans. I’d love to start with this one. 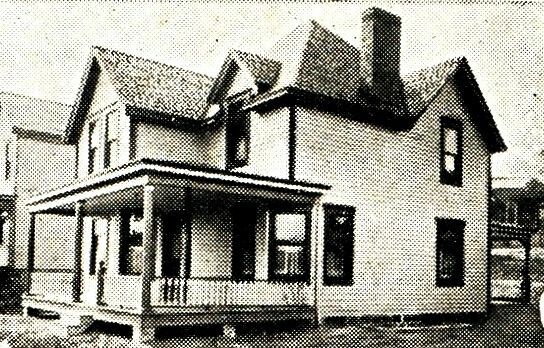 If you’re here for the first time, you may be wondering, what is a Sears House? 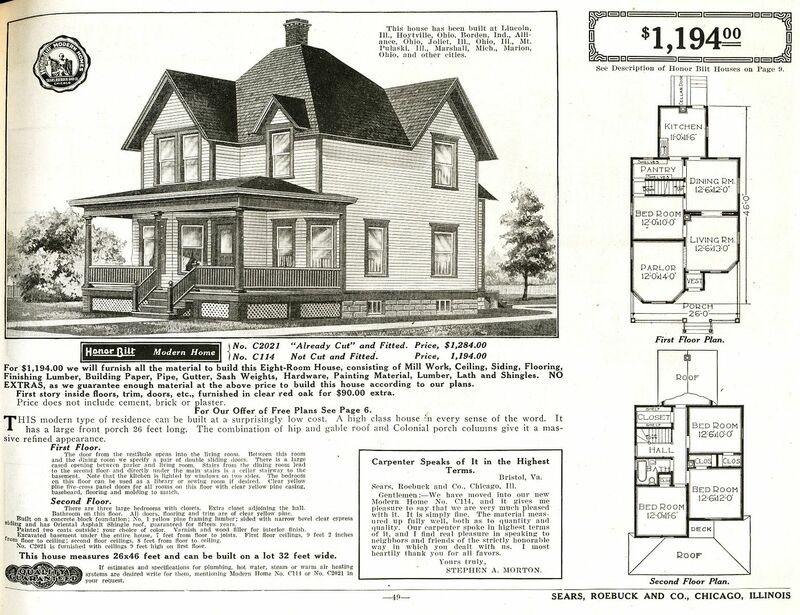 In the early 1900s, Sears sold entire kit homes through their mail order catalogs. 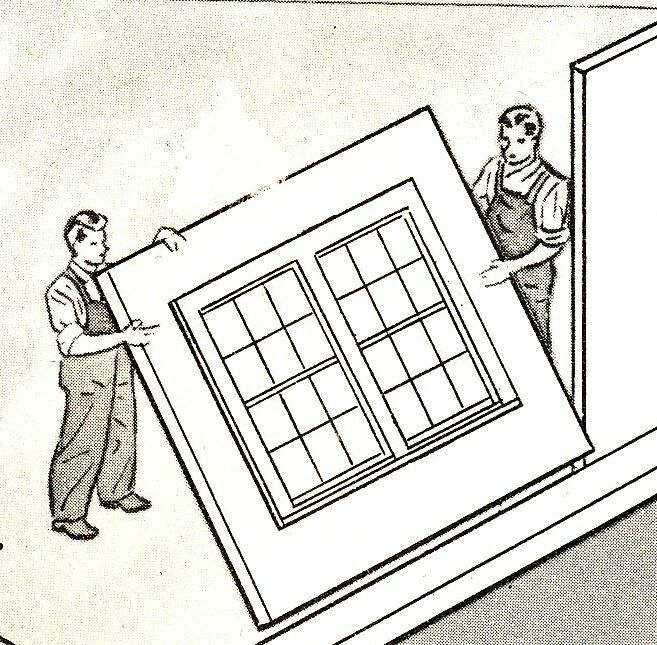 The 12,000-piece kit came with a 75-page instruction book that promised the homeowner, “You can not make a mistake.” Typically, it took the average neophyte builder 3-6 months to complete assembly of his home. Want to see the fanciest kit home that Sears offered? Click here. 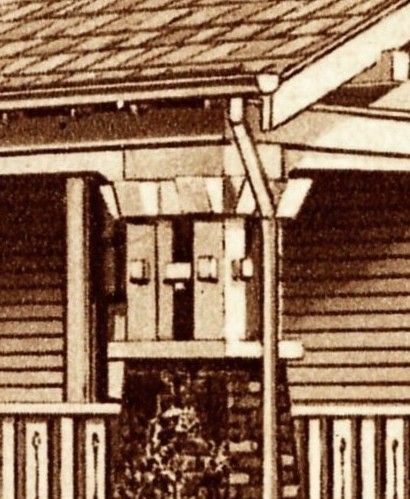 Do you know where this house is? Please leave a comment below. And please share this link with your New Orleanian friends on social media! Oooh, part II is here! This house was built in New Orleans. Is it still alive? Modern Home 264P165 is a model I've never seen in real life, and yet, we know there were at least three built (and perhaps many more). 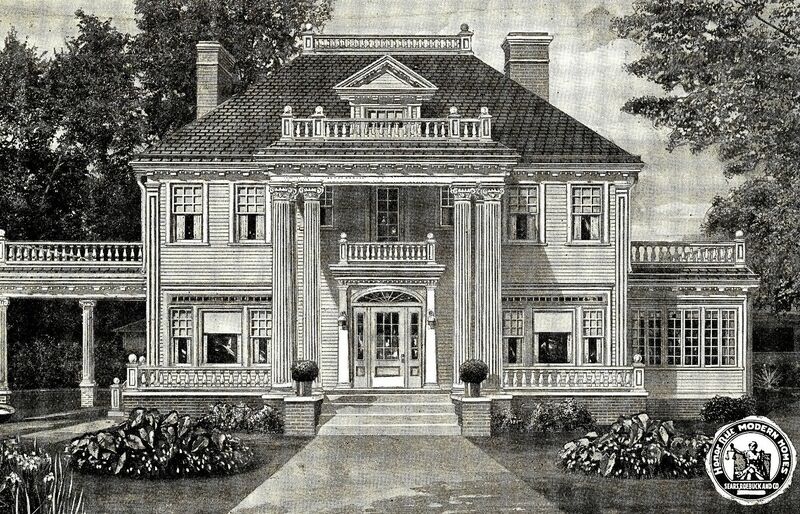 This image was in the 1914 catalog, and yet it does not appear in 1912 or 1916, so it was short-lived. Where's the house in New Orleans? 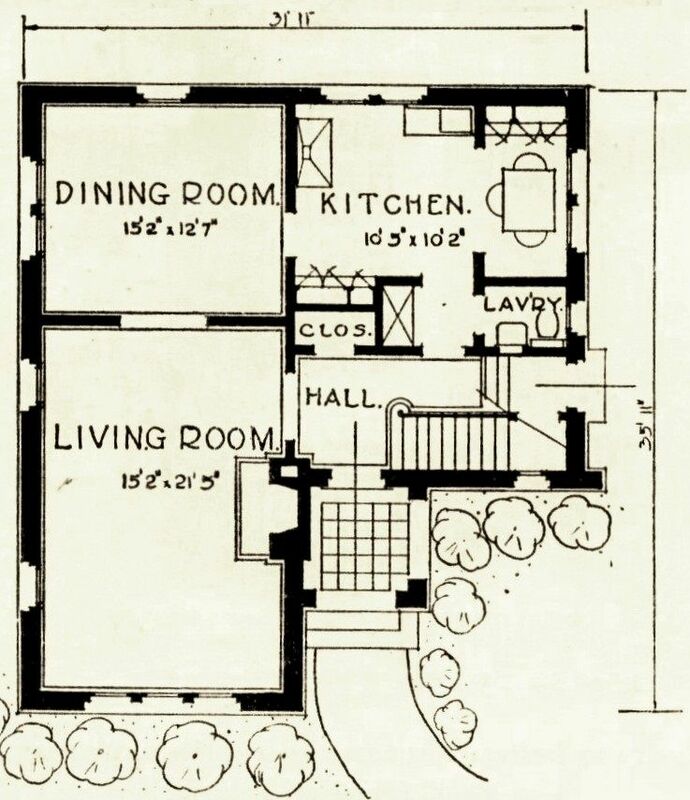 Fortunately, the floor plan is odd enough that it should be fairly easy to identify. 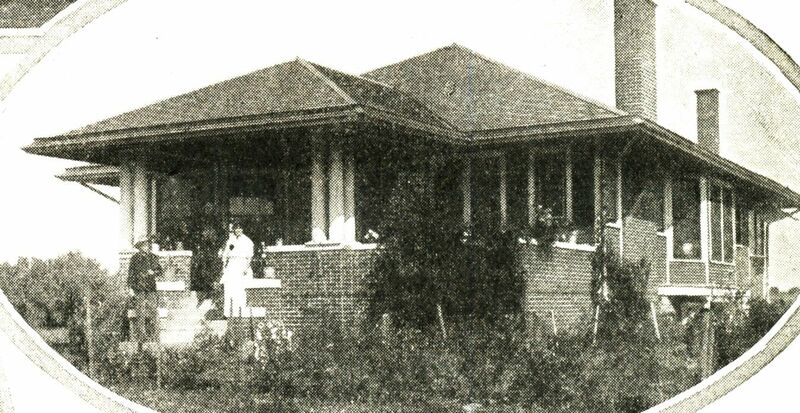 "Particularly planned for southern states..."
To read about a beautiful Sears House in Texas (which is a beautiful story), click here. 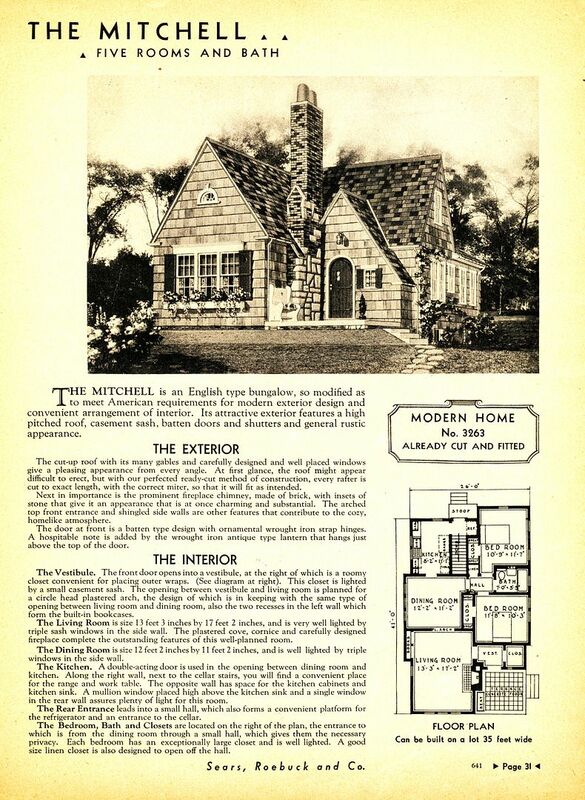 Recently, Rachel Shoemaker was looking through a Sears Modern Homes catalog (1930) when she discovered a testimonial for a Sears Elmhurst built in Flushing, New York. 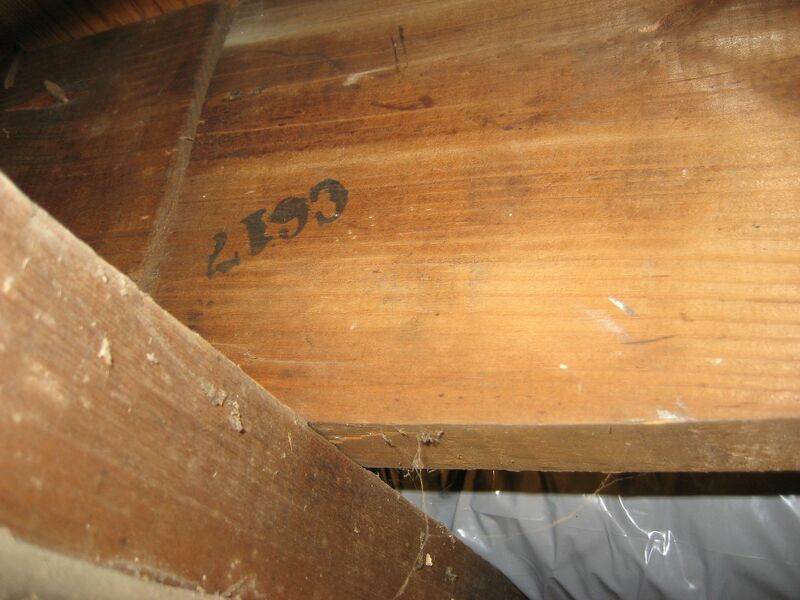 She then did some extra digging and was able to glean the home’s current address. In fact, Rachel wrote a blog on her wonderful discovery (click here to see it). Now, we need someone near Flushing to snap a few photos of this grand and elegant home in Flushing. If you’re near the area, please leave a comment below and I’ll contact you toote suite! 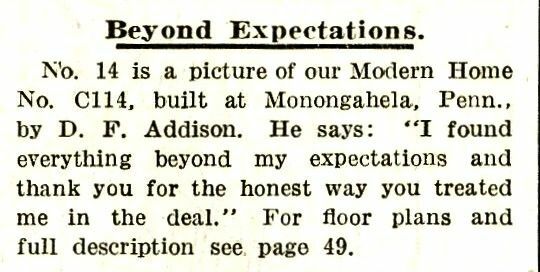 Here's the testimonial that Rachel found in the 1930 Sears Modern Homes catalog. I have a feeling that the Zvanovec's are no longer extending an open invitation to visit their home. Nonetheless, it sounds like they really did love their home, and were very proud of it. Close-up of this beautiful Sears Elmhurst in Flushing, NY. Look at the beautiful stone work on the front porch. 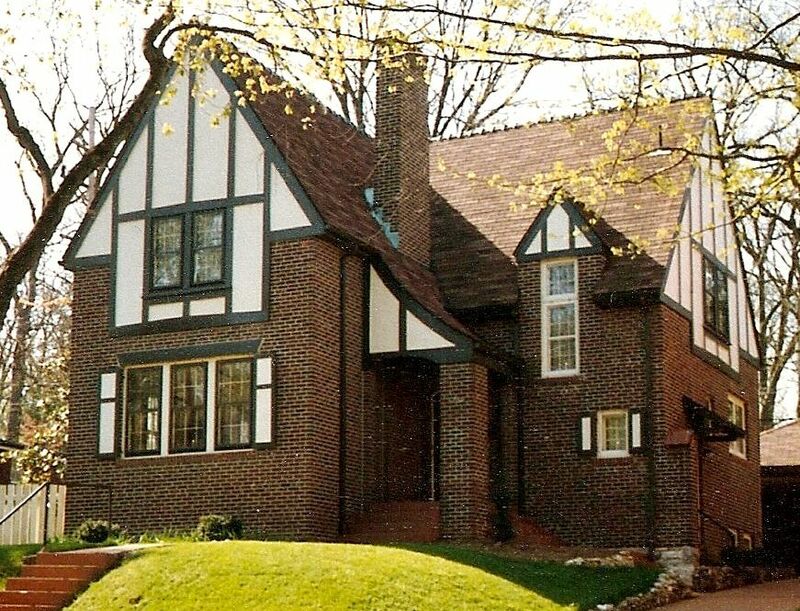 And here's the Elmhurst recently discovered in St. Louis. 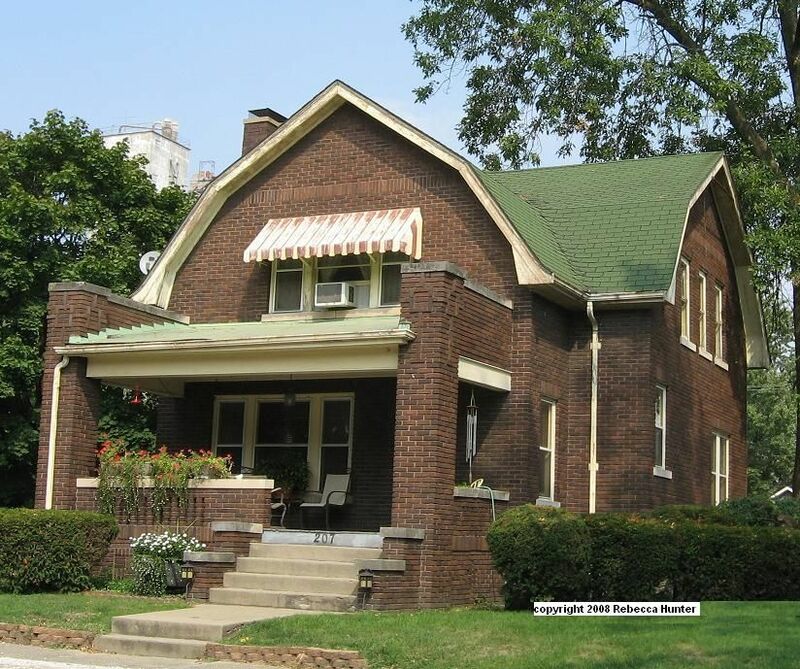 Here's an Elmhurst in a Chicago suburb (originally discovered by Rebecca Hunter). 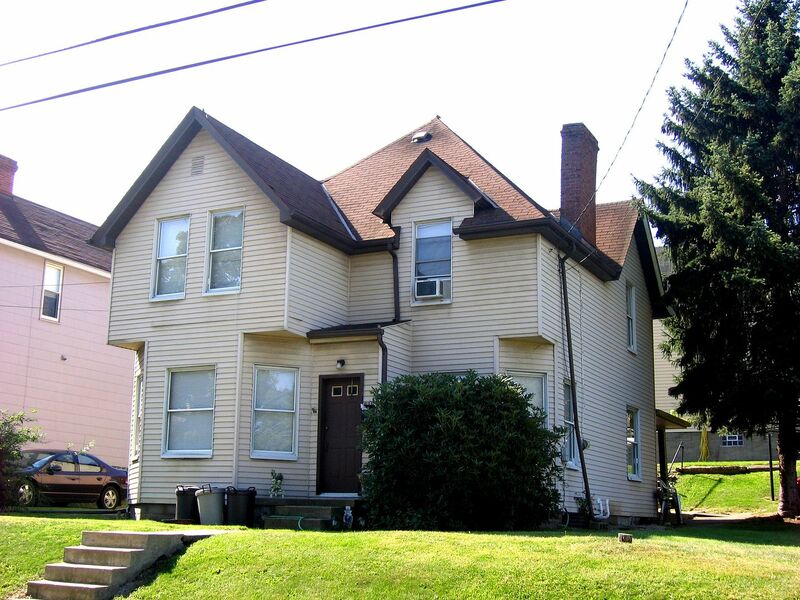 Notice this house has the decorative blocks under the faux half timbering on that front gable. These blocks are missing from the Elmhurst in St. Louis and Flushing, NY. This Elmhurst and the one in Flushing are both brick veneer, whereas the one in St. Louis is solid brick. 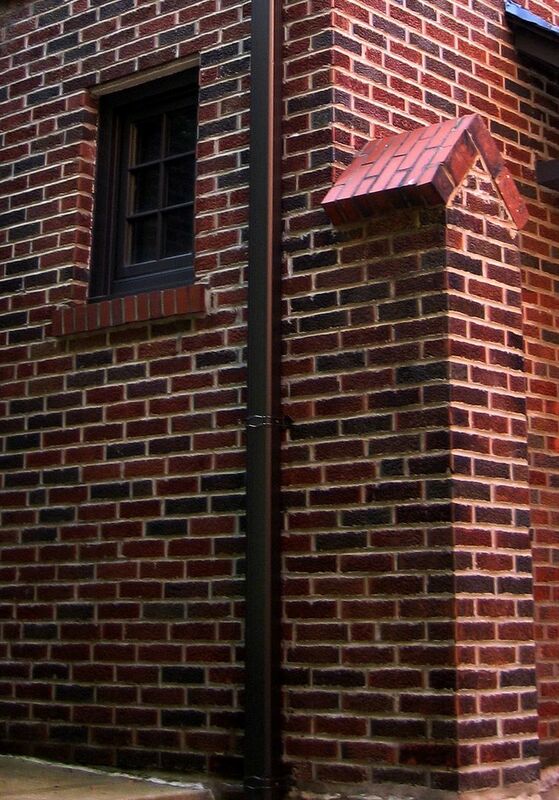 As mentioned in the prior blog, solid brick is very unusual on a Sears kit home. Is this a Sears Elmhurst? I think it's likely but I'm not certain. It's in Rocky Mount, NC where I found an abundance of kit homes from both Sears and Aladdin. It's not a spot-on match but it's darn close! This is such an unusual house, I'd be inclined to say it probably is an Elmhurst. Probably. 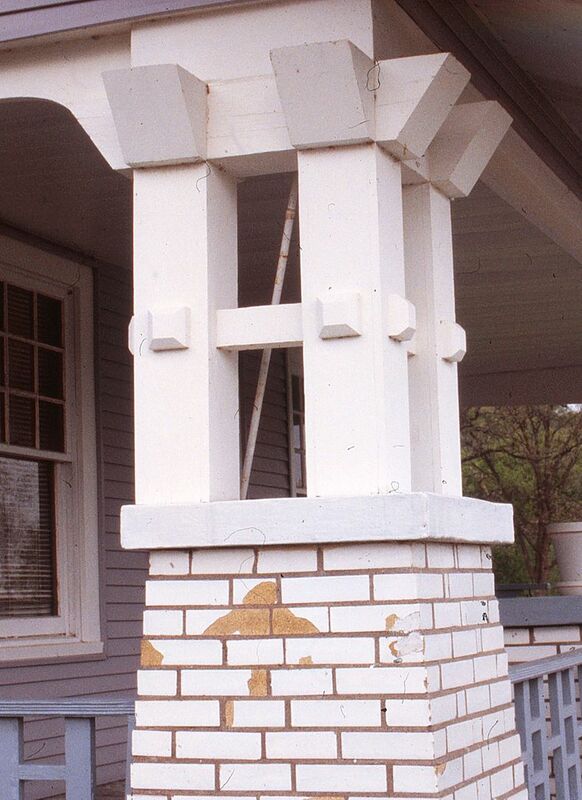 Notice, those decorative blocks are in place under the front gable. 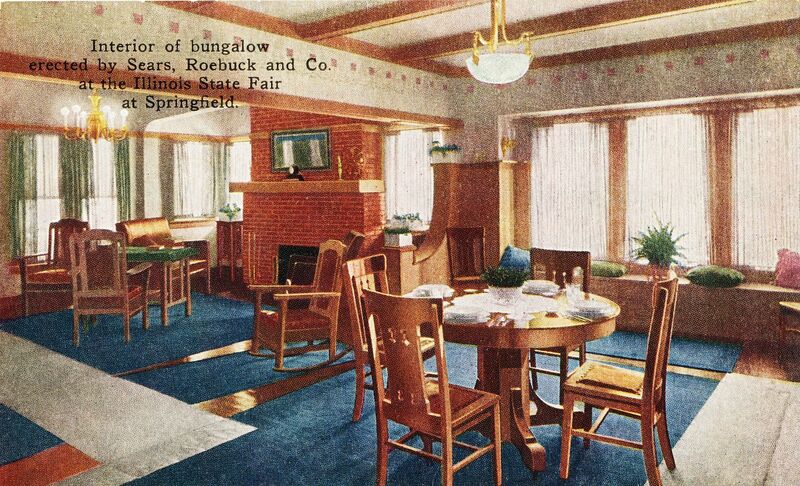 The Elmhurst was "featured" in the 1930 Sears Modern Homes catalog and had a two-page spread, including this colorized image. Notice, the blocks are shown in the catalog image. Are you near Flushing? Would you be willing to get some good, high-resolution photos for us? If so, please leave a comment below! 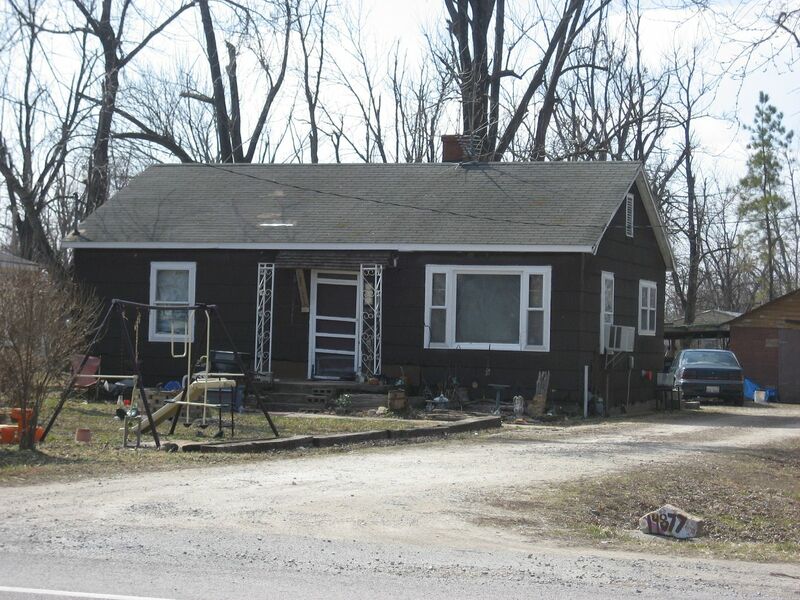 To read more about the kit homes I found in Rocky Mount, click here. To read more about the Elmhurst, click here. 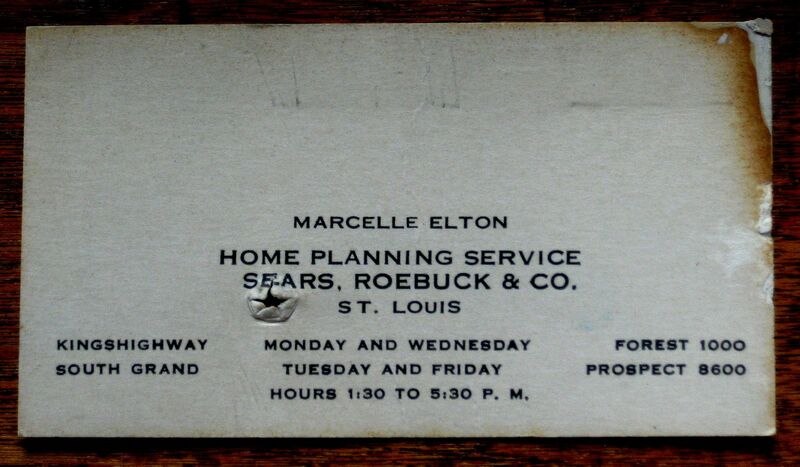 Several weeks ago, a reader of this blog told me that he owned a Sears Elmhurst in St. Louis, and he was kind enough to send me a few photos. To my surprise and delight, he was right! It really was an Elmhurst. Last month, I visited the Elmhurst “in person” and my oh my, what a treat! 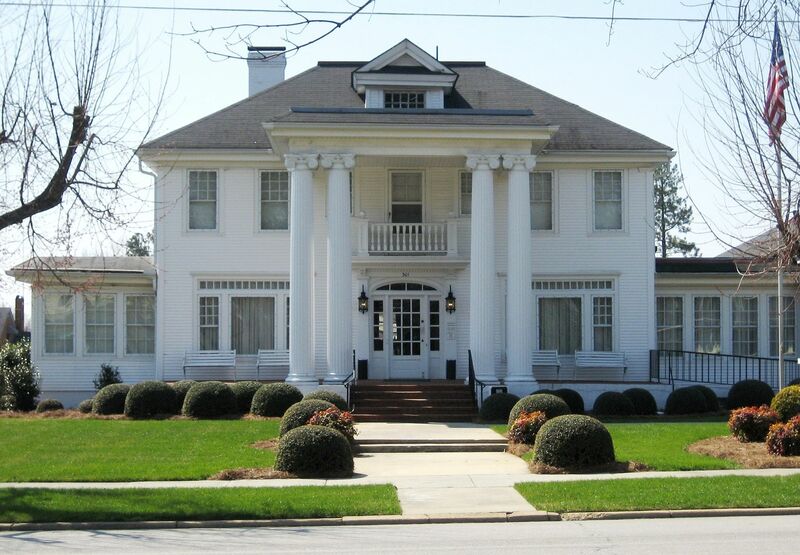 The home’s current owners have a deep abiding respect and appreciation for the unique origins of their historic home. 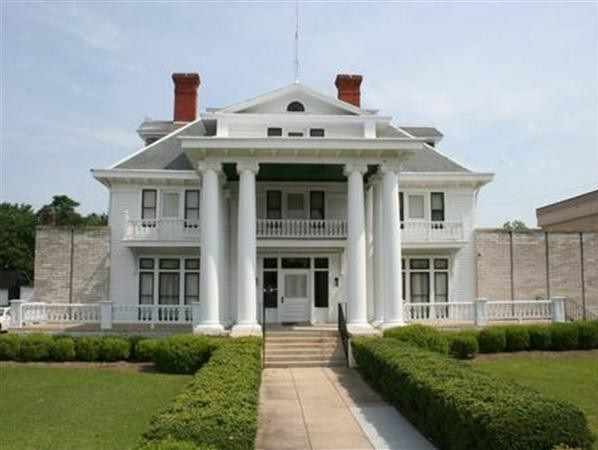 In other words, they really love their old Sears House, and have been faithfully researching the history of this beautiful old house, and restoring it, inch by inch. Thanks so much to the home’s owners who were gracious enough to let me take a tour of their home and share a few photos of its interior! 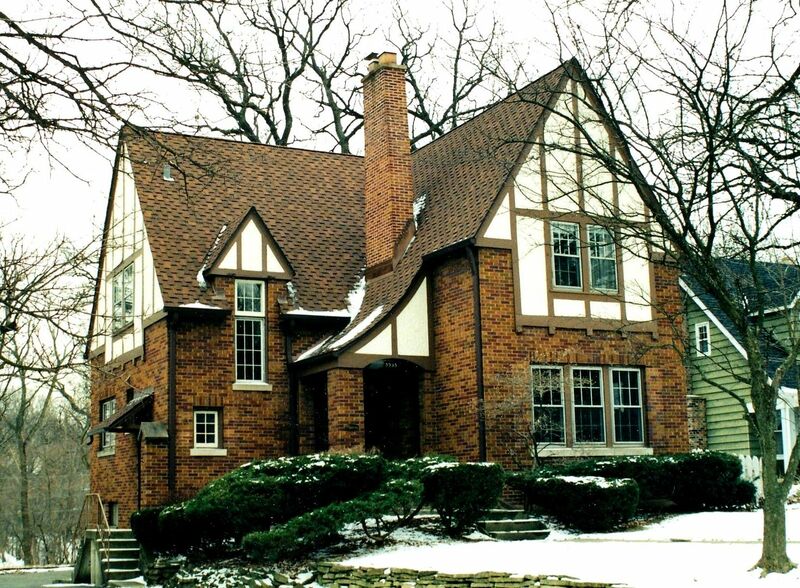 The Sears Elmhurst was a classic (and classy) Tudor Revival with a "half-timber effect" on the second story. Inside, it had three bedrooms and 1-1/2 baths. The house in St. Louis is in mostly original condition. The living room and dining room were spacious. The kitchen and lavatory were not. 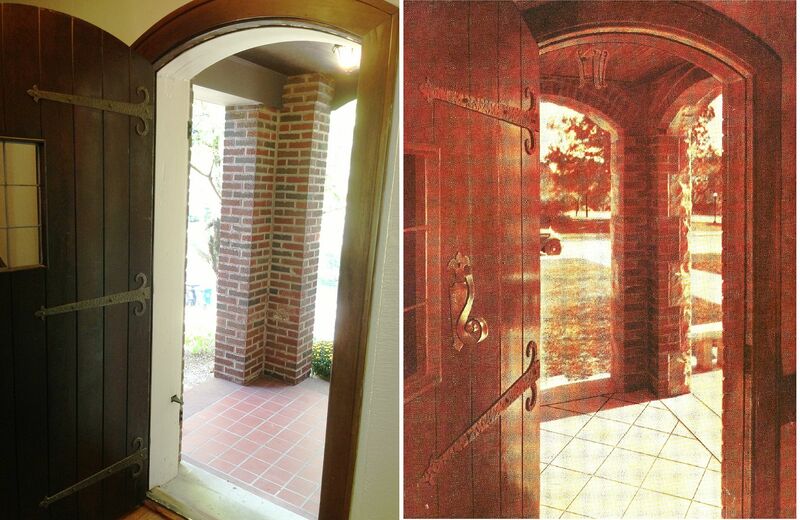 The cover of the 1932 "Homes of Today" showed this fetching entryway, which is from the Elmhurst. 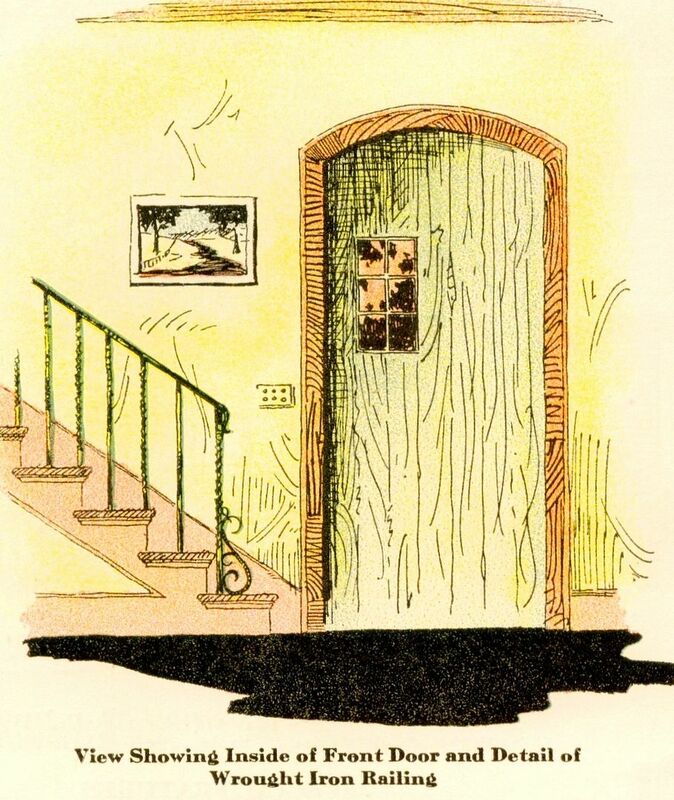 It's kind of a "Twilight Zone" doorway, out of the hubbub of busy city living and into another dimension of peace and joy and "the satisfaction that comes from building your own home" (as Sears promised in their literature). 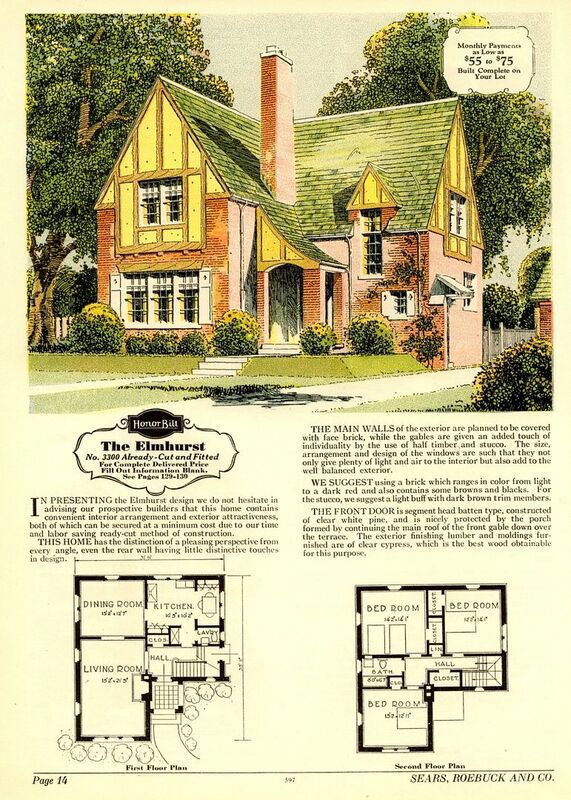 In the 1930 Sears Modern Homes catalog, the Elmhurst was given a two-page spread. 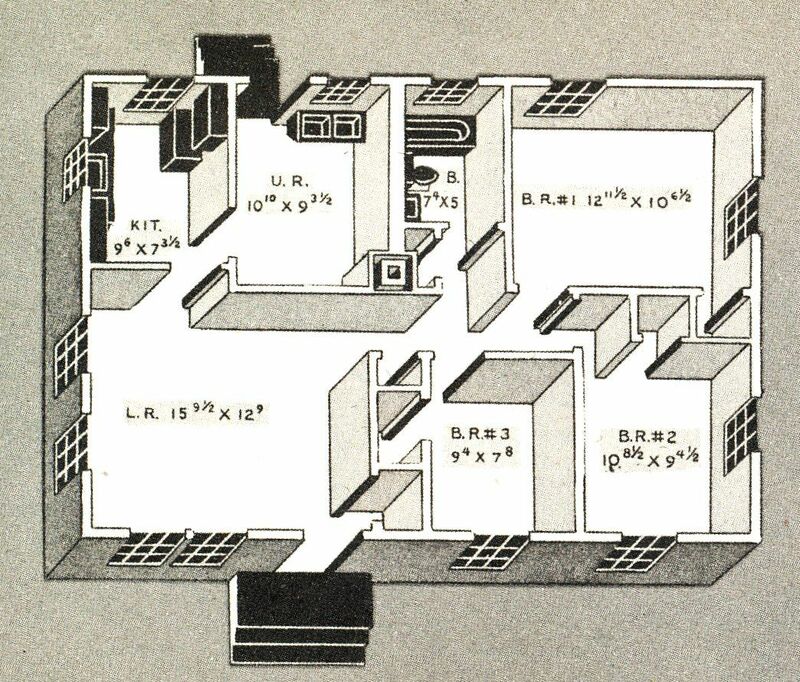 Even in the simplified line drawings (from the 1930 catalog) the Elmhurst looks quite elegant. The Elmhurst in St. Louis is a perfect match to the catalog image. Just perfect. The St. Louis house is being faithfully restored by its current owners, and it's a real beauty. 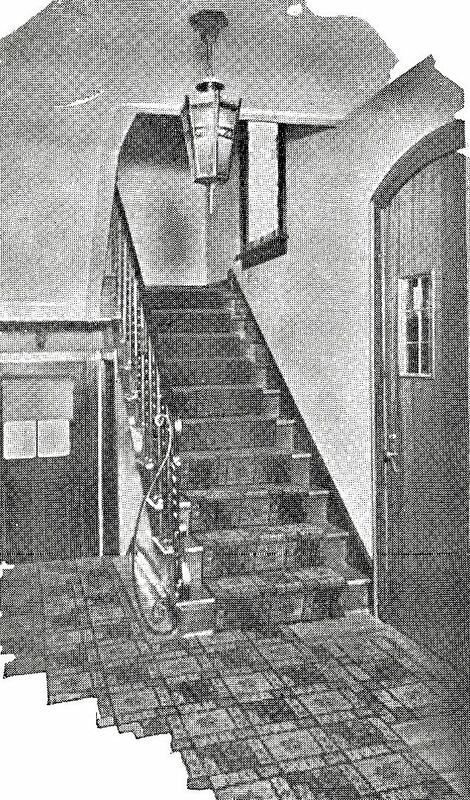 Close-up of that entryway shown on the front cover of the 1932 catalog. 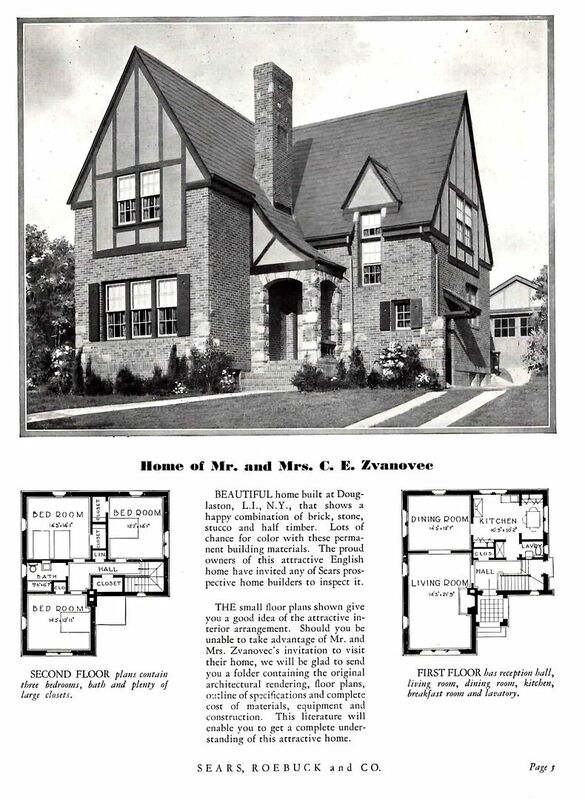 And a fine side-by-side contrast of the St. Louis Elmhurst (left) and the entryway shown in the catalog. 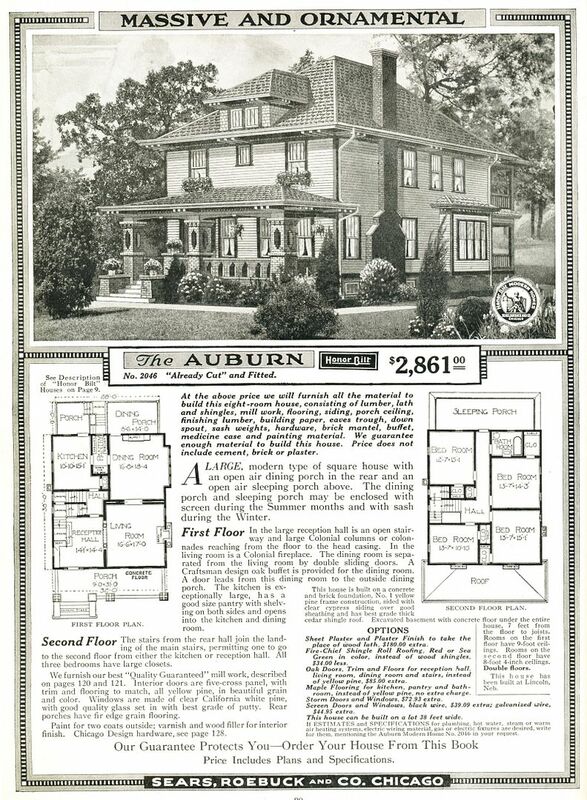 The 1932 "Homes of Today" Sears Modern Homes catalog showed this view of the Elmhurst built in Ohio. The Elmhurst in St. Louis is a good match to the black/white image above. The "Elmhurst built in Ohio" is shown here on the right, and the Elmhurst in St. Louis in on the left. 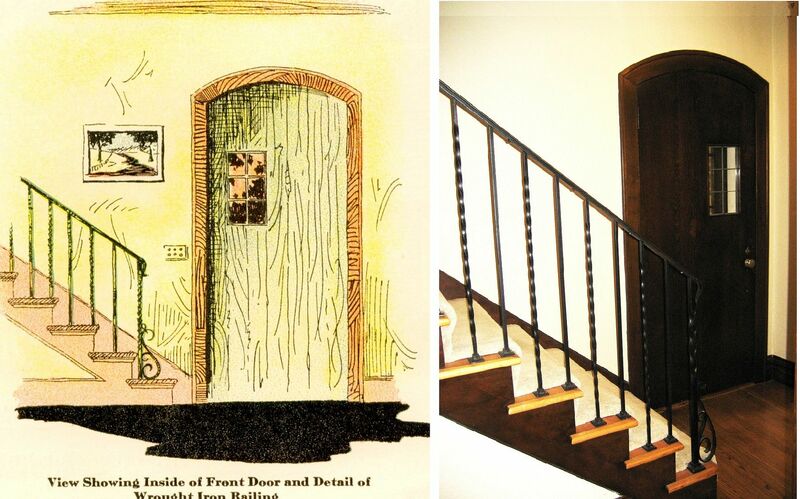 The details are perfect with two lone exceptions: The front door is hinged different in the St. Louis house, and that decorative "S" is missing from the base of the wrought-iron staircase railing (which looks like it'd be a knee-buster anyway). The flip-flops are missing from the Elmhurst in Ohio. 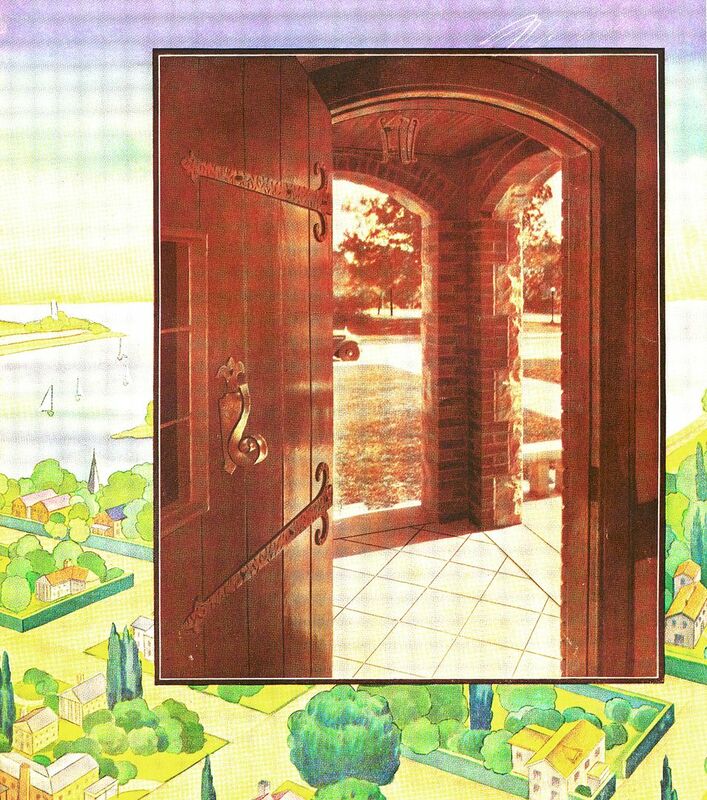 La Tosca door hardware was a very popular choice in Sears Homes. 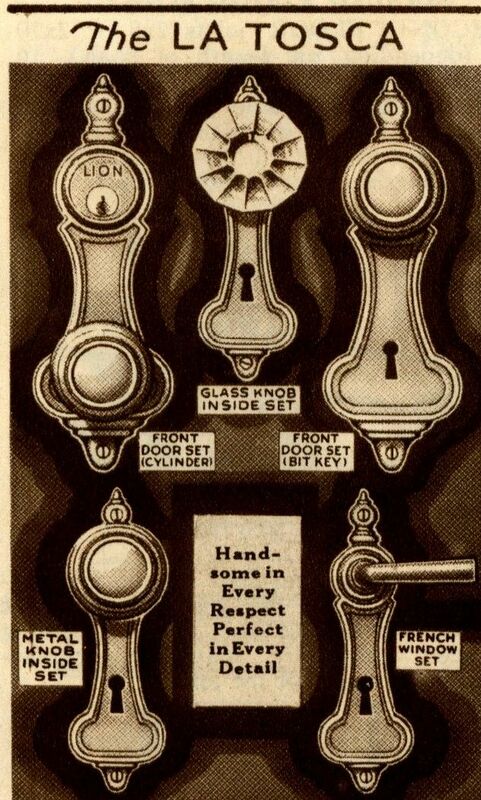 The LaTosca door hardware, as seen in the Elmhurst and as seen in the 1928 Sears Modern Homes catalog. 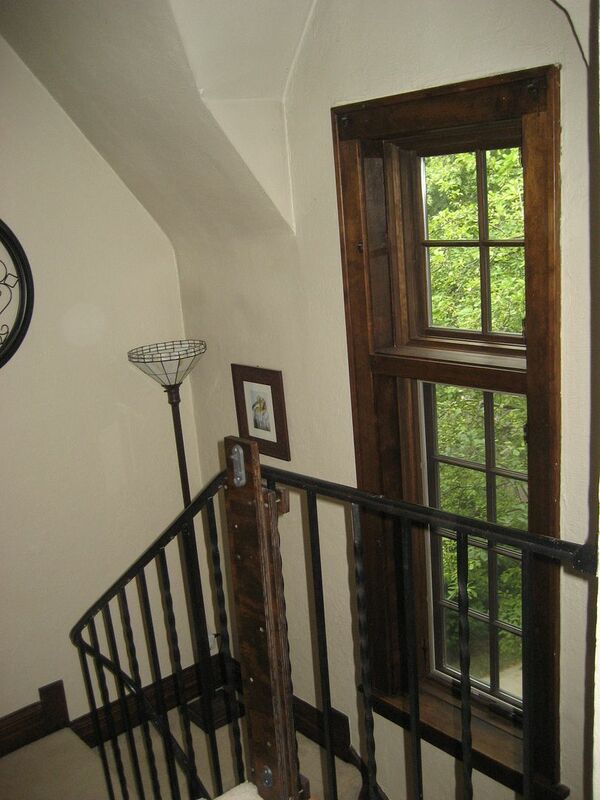 The moldings and trim in this Elmhurst are birch, according to the owner. Based on the research he's done, I'd say he's probably right. 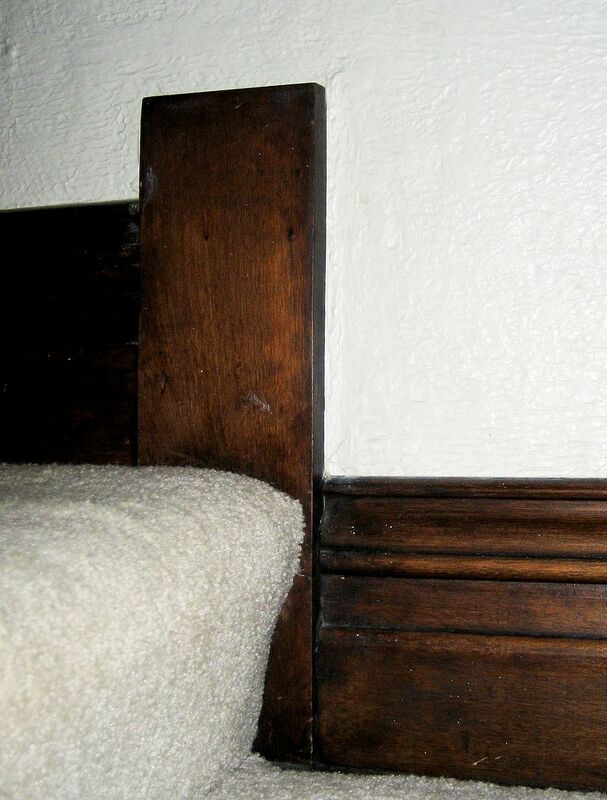 The owner is doing a remarkable job of restoring the inherent beauty of all the original wood trim throughout the house. 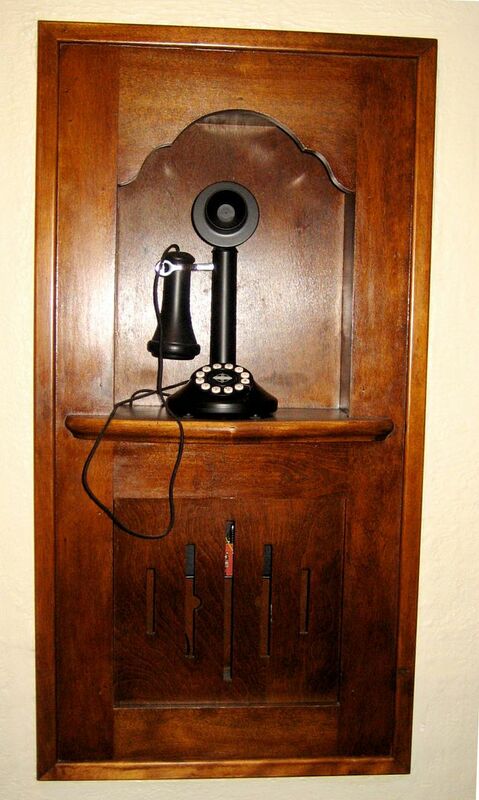 The patina and beauty of the natural wood finish on this phone niche isn't accurately represented by this dark photo. 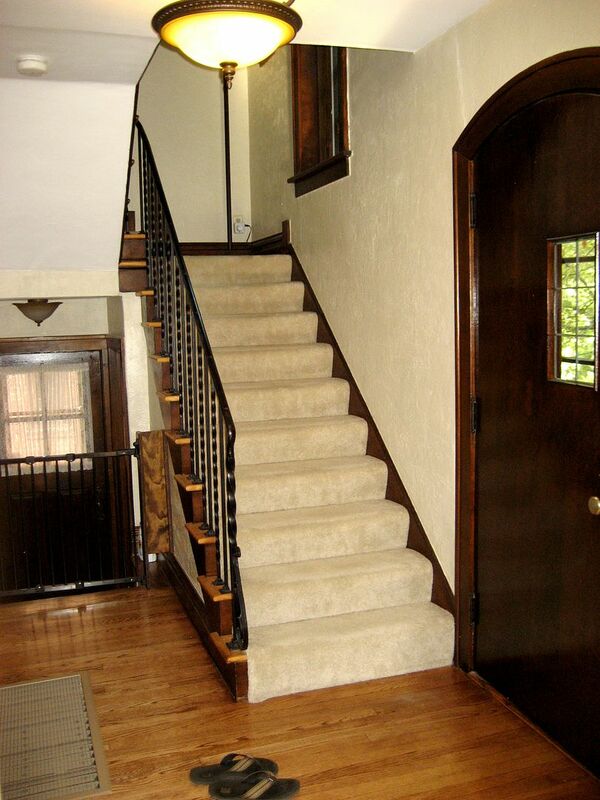 While walking through the house, I couldn't help but to "reach out and touch" the beautiful wood trim. It really is that beautiful. 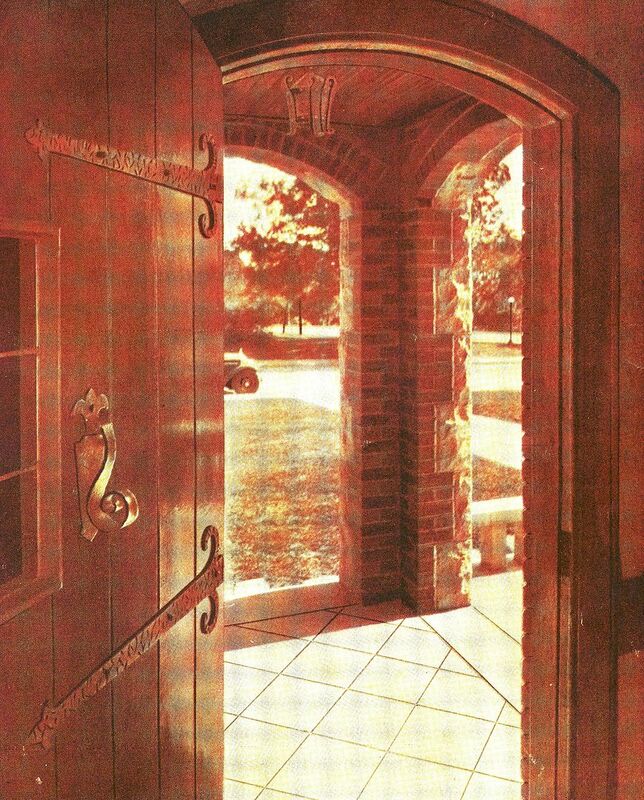 The 1930 Sears Modern Homes catalog showed this view of the front door (interior). 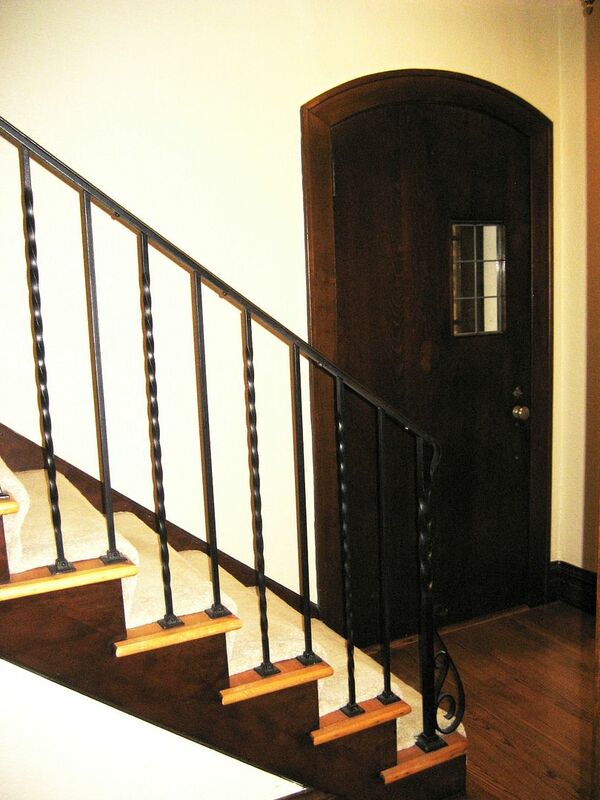 Note that the stylistic "S" is missing from the wrought-iron railing in this picture. There was a wall that blocked my shooting the door and staircase from the same angle as shown above, but I got pretty close. This house was a one-hour trip from my brother's home in Elsah, IL (where I was staying), but once I saw the inside of this house, I was mighty glad I'd made the effort. In every way that an old house can be truly stunning, this house *was* stunning. It's a real gem in the heart of St. Louis. 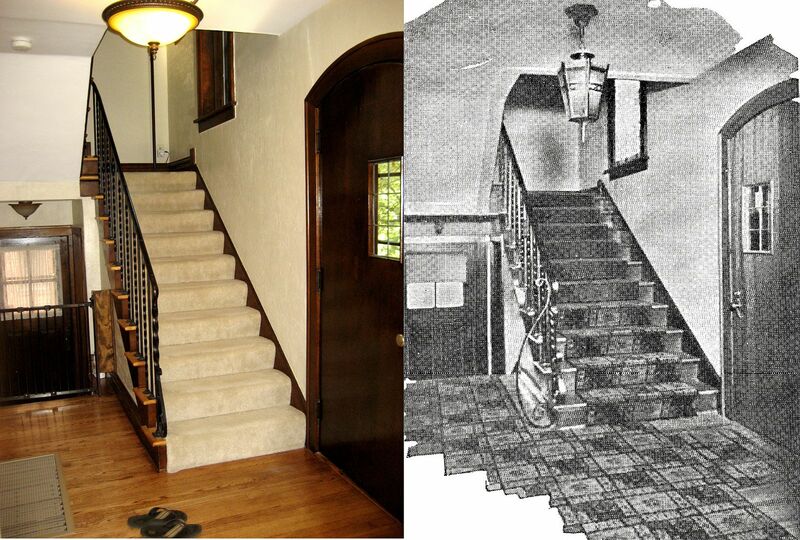 Comparison showing the 1930 catalog image and the real live house in St. Louis. 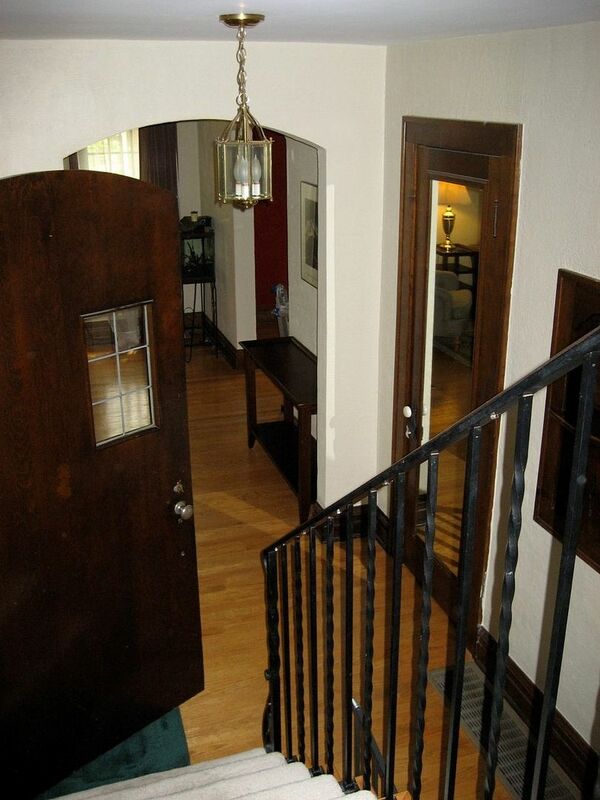 From this view (near the landing), you get a better idea of the size of the hallway. 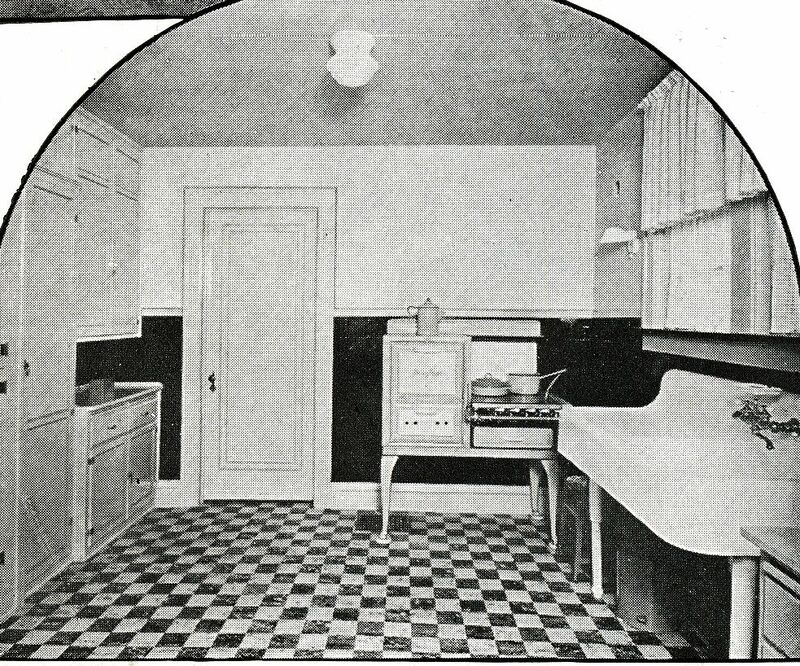 The kitchen of the Elmhurst (as shown in the 1932 catalog). 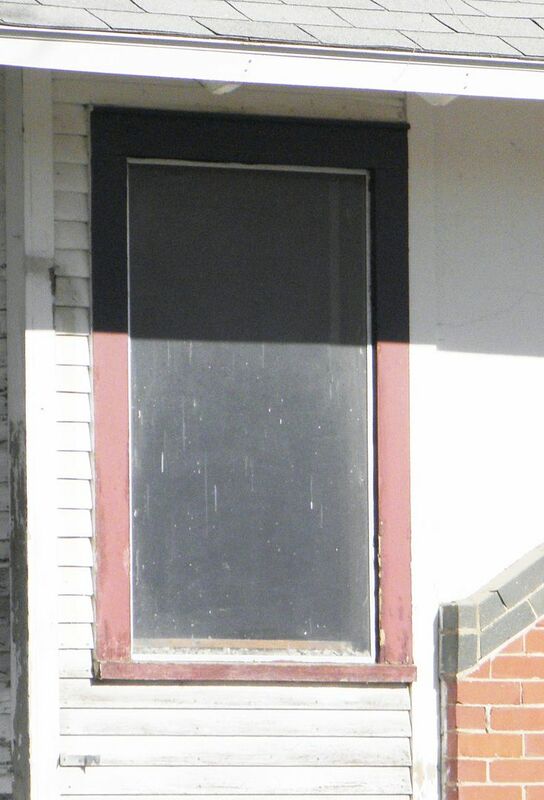 This appears to be a photo, and the picture was taken by someone standing with their backside leaning hard against the right rear corner of the house, looking toward the door that opens into the dining room. 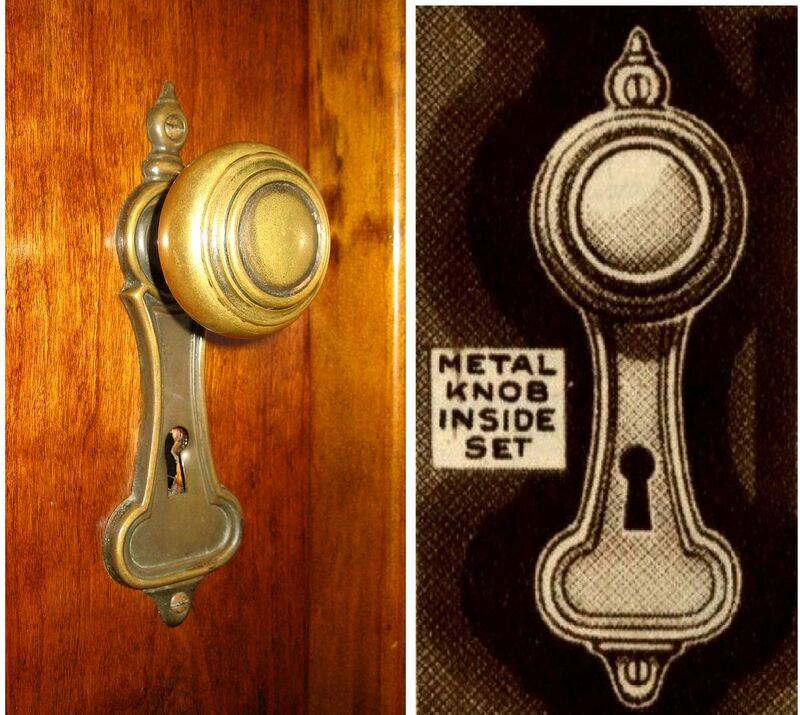 Notice the La Tosca hardware on the door. The Elmhurst's kitchen today, from that dining room door, looking toward the right rear corner. While I'm a big fan of all things old, even I'd agree that the kitchen needed a little bit of updating for the 21st Century. 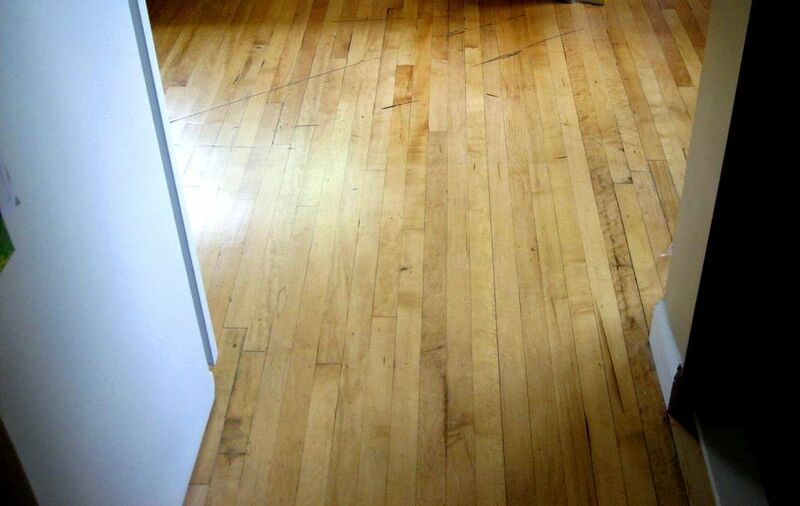 Most Sears kit homes had maple floors in the kitchen and bath (underneath the floor coverings). The owners of the Elmhurst tried to restored the maple floor in their kitchen but these floors were really intended to be used as a subfloor, not a primary floor. 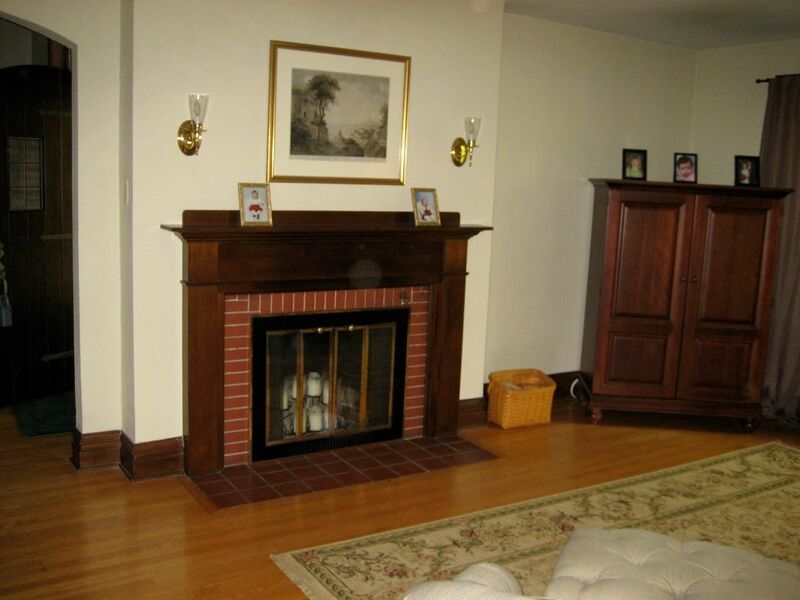 The fireplace in the living room has the same square slate tiles as seen on the front porch. This over-sized landing window was another lovely feature of the Elmhurst. As seen from the outside, this is the tall dormer window just to the right of the front porch (as seen from the street). Downstairs looking up at the staircase window. 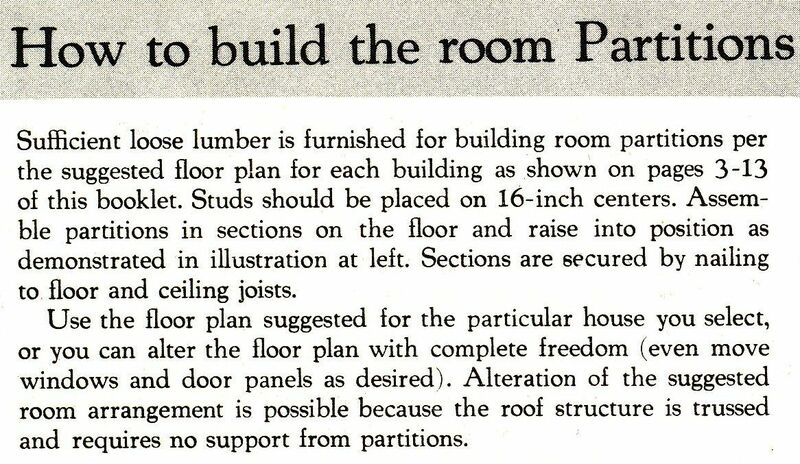 A distinctive feature found in two-story Sears kit homes are these plinth blocks. 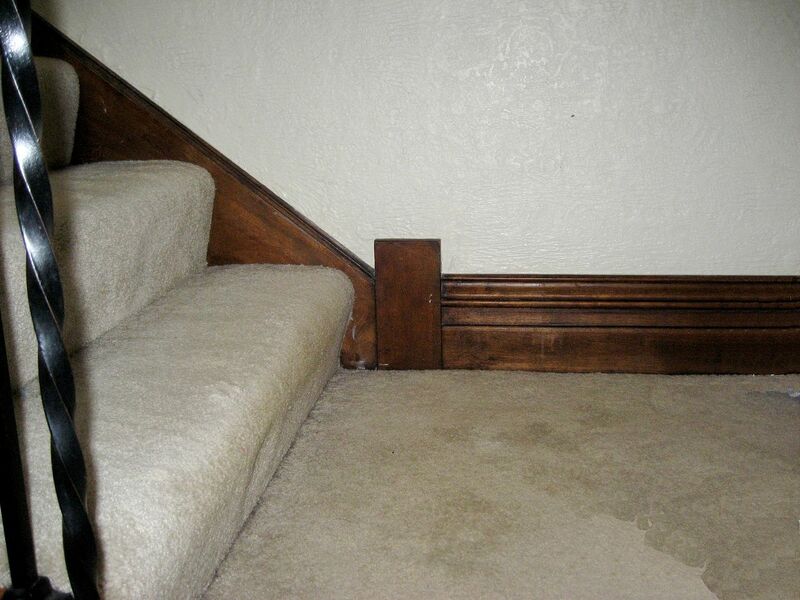 These square blocks were used to help the novice homebuilder cope with complex joints. The landing of the Elmhurst had three of these plinth blocks on one landing. I do believe that that's the most plinth blocks I've ever seen in one kit house. The plinth block at this juncture is actually two-steps tall. While doing some work on the home, the owner found this business card inside a wall. I've seen a lot of very cool ephemera in my fun career, but this is one of the best. 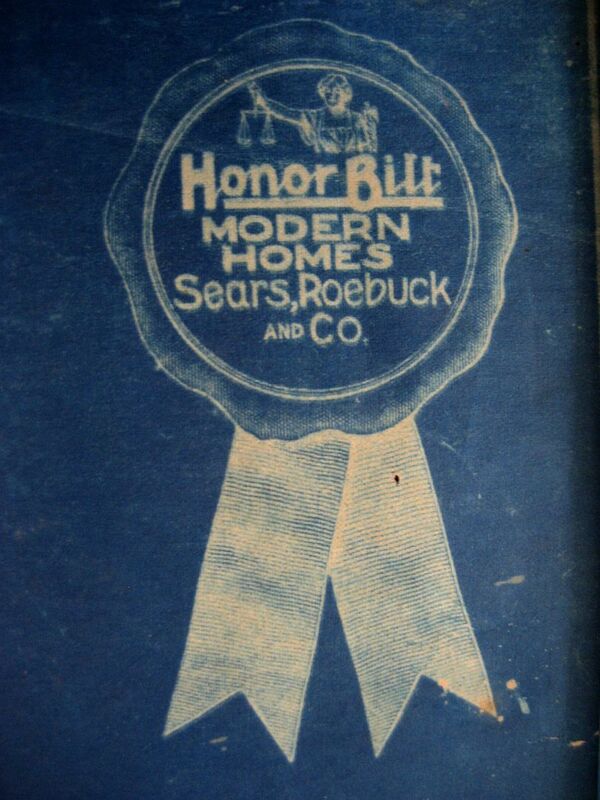 There were only 40 Sears Modern Homes "Sales Centers" in the country and there was one in St. Louis. Folks could stroll into these storefronts and get a first-hand look at the quality of framing members, millwork, heating equipment and plumbing fixtures. 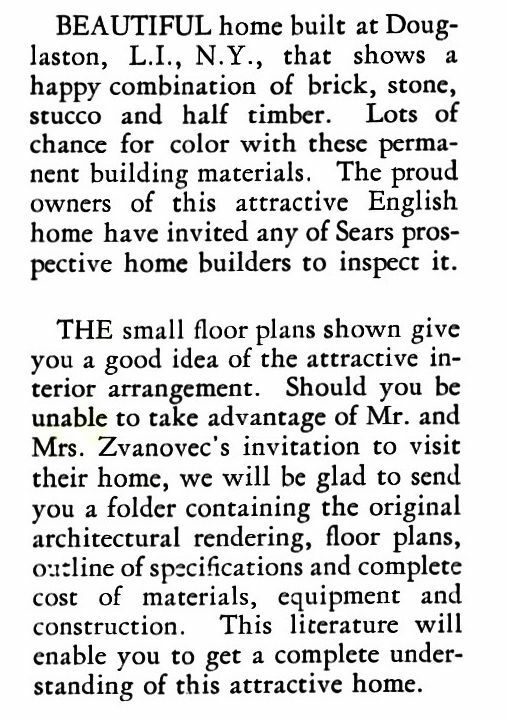 Apparently Miss Manning visited the Sears Modern Homes Sales Center and had some discussion with Marcelle Elton about her new Elmhurst. 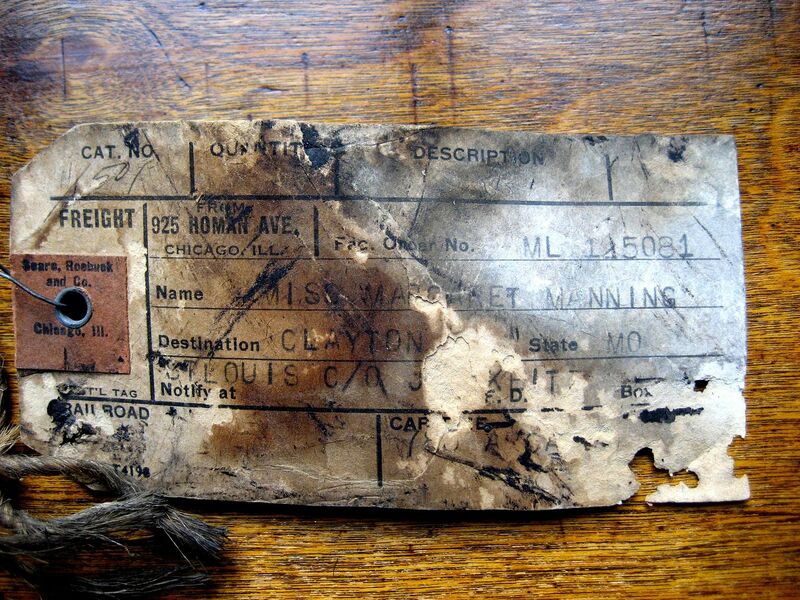 The home's current owners found this tag attached to a cast-iron pipe inside the kitchen wall. 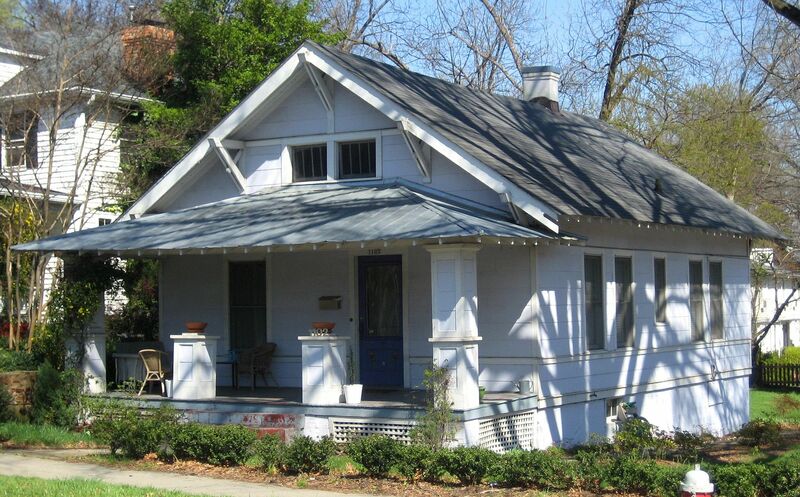 It shows that the home's purchaser was a "Miss Margaret Manning" of Clayton, Missouri. 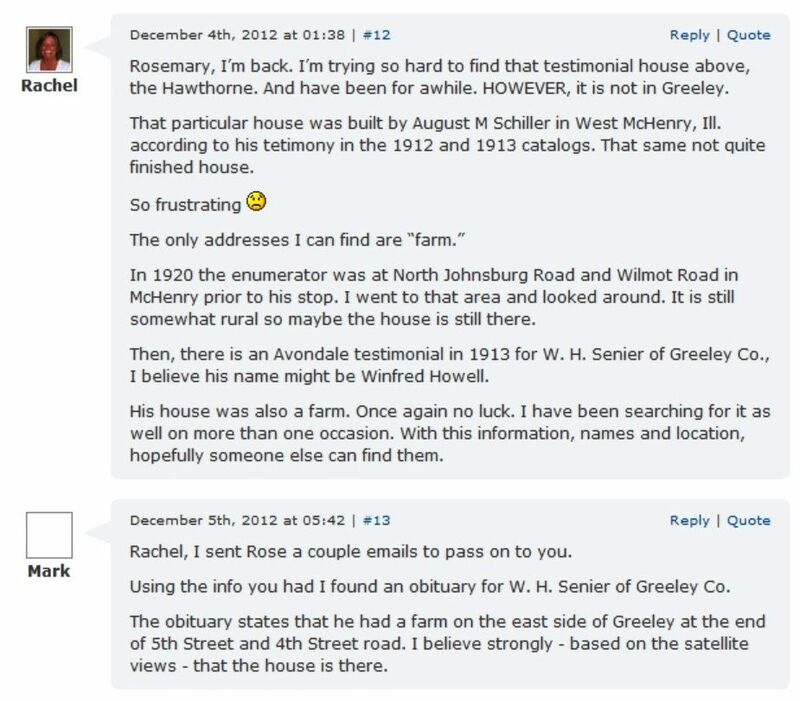 For those interested in genealogy, I would LOVE to know where Miss Manning lived before she purchased the house in St. Louis and what she did for a living. 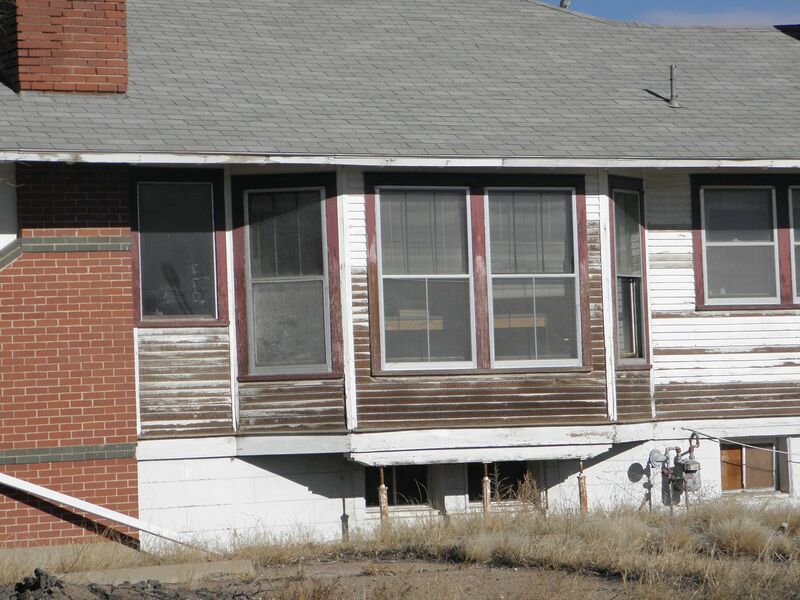 Lastly, I'd also be interested in knowing how long she lived in this house. 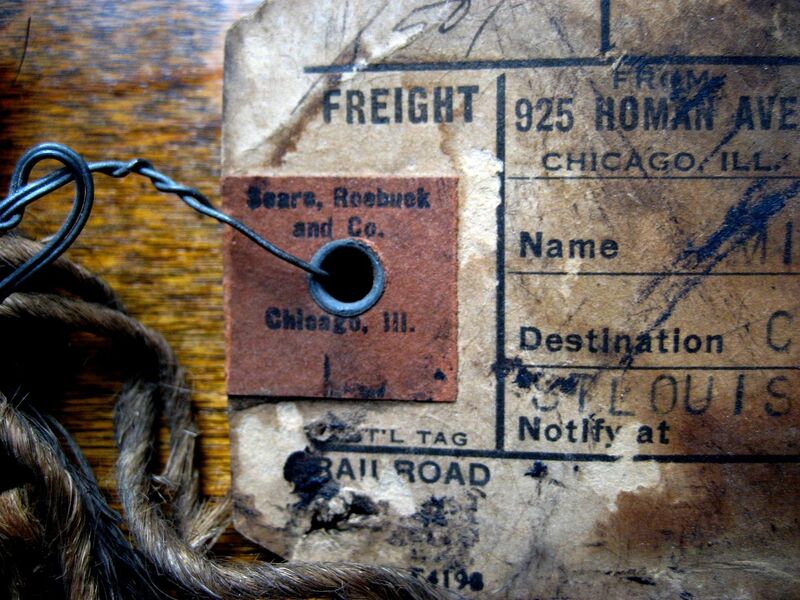 Close-up of the tab shows a return address of 925 Homan Avenue, in Chicago, Illinois. From all angles, the Elmhurst is quite stunning. On the inside, those dormers look like this. The Elmhurst in St. Louis is an enigma for several reasons. 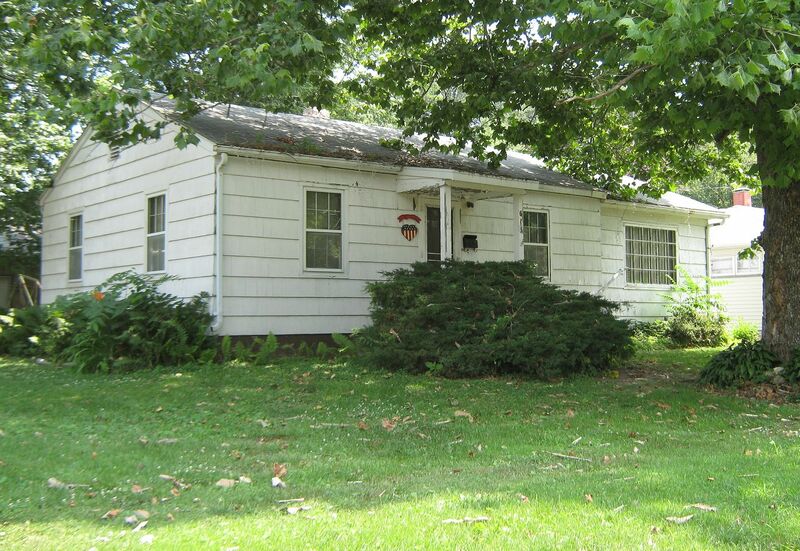 One, this is not a frame house with brick veneer (like every other "brick" Sears kit house I've ever seen). This house is solid brick, and when the owner remodeled the kitchen, he said the exterior walls had furring strips (typical of a solid brick house). And the flashing and original gutters were copper. 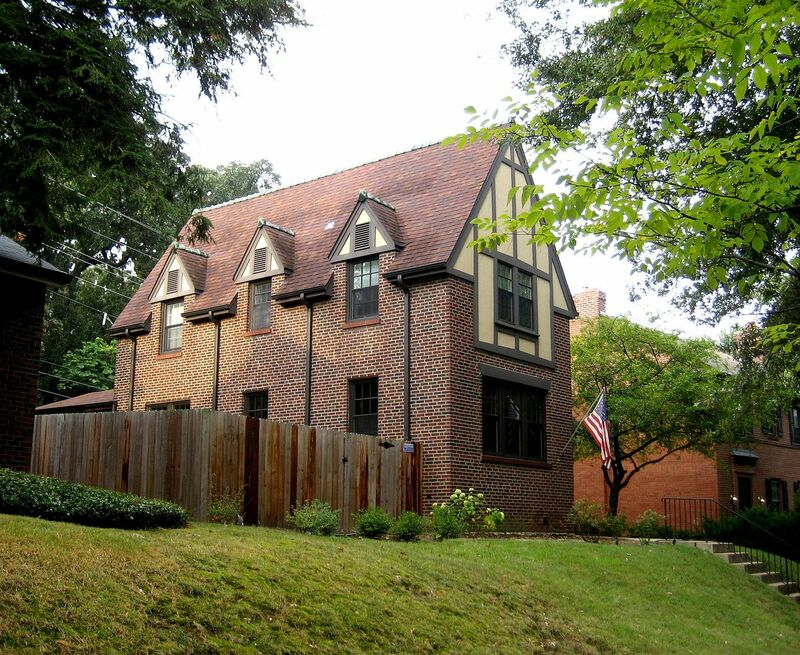 When built, the house had a tile roof. 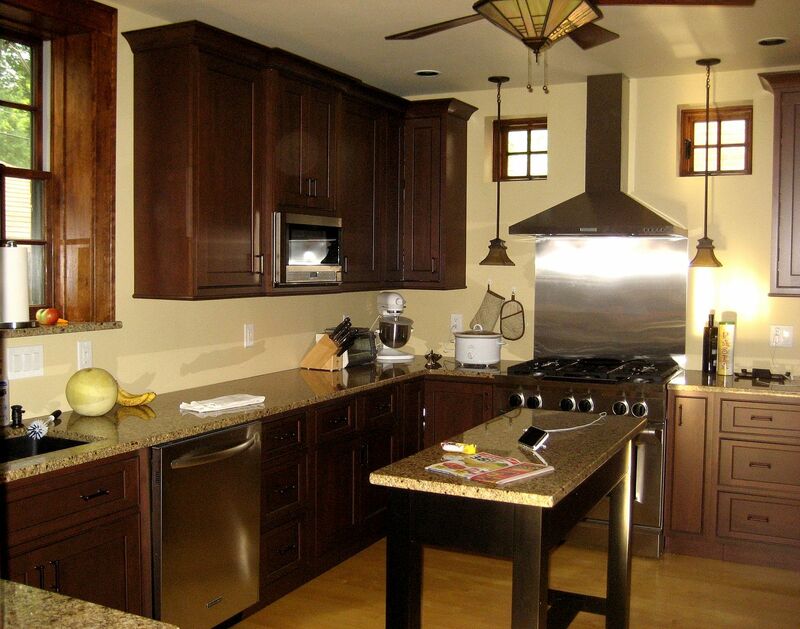 These are all significant upgrades and probably cost the home's first owner quite a bit extra. This photo was taken by the home's current owner. You can see a remnant of the tile roof on the ridge of the house. And if you look closely, you can see the copper flashing around the chimney. 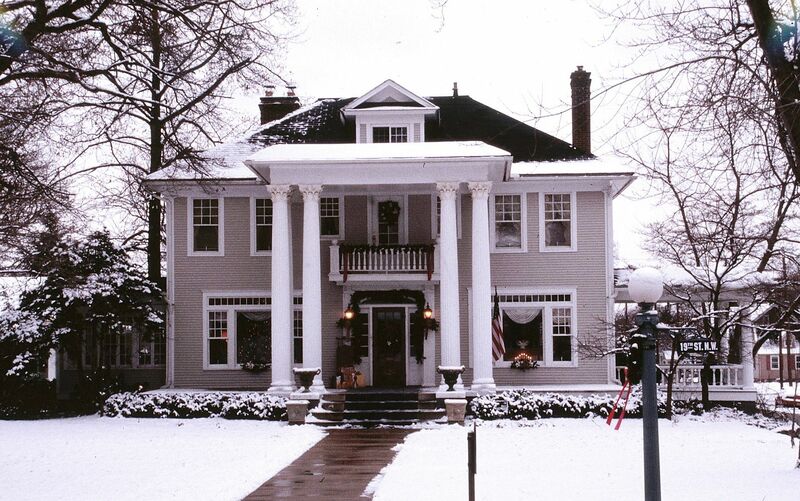 There's another Elmhurst in a Chicago suburb that Rebecca Hunter found. 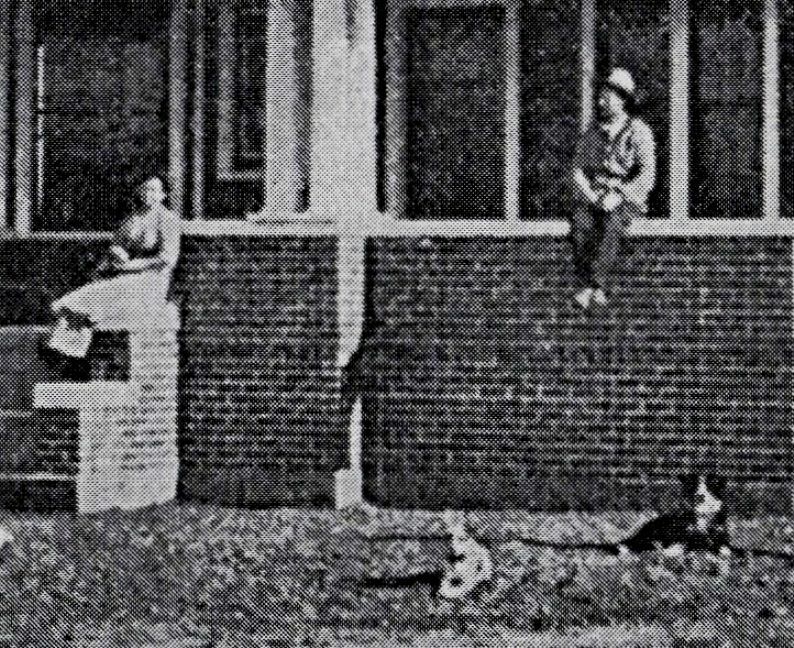 This Elmhurst has concrete sills (as you'd expect to see on a kit house, because it's simpler than laying brick), but the house in St. Louis had *brick* sills. The Elmhurst was beautiful, but not very popular. It was offered from 1929 to 1932. 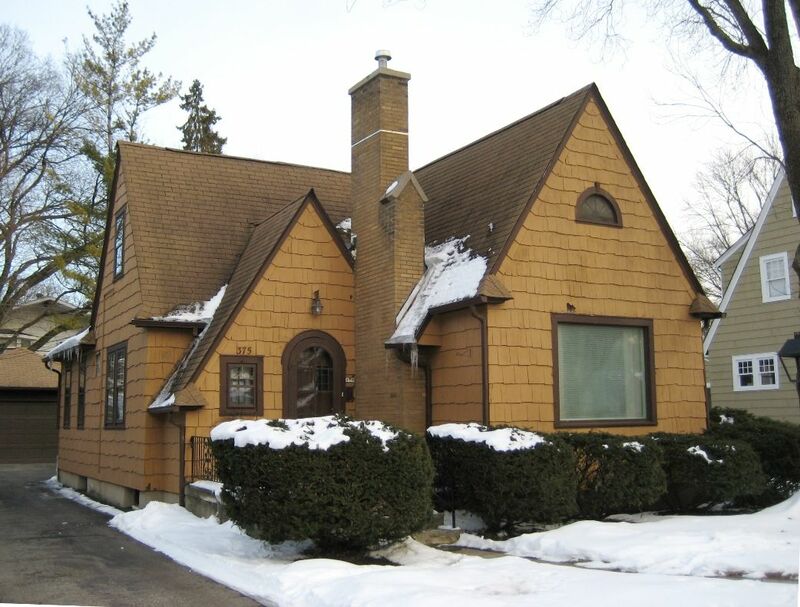 Thanks again to the home’s current owners for sharing their Elmhurst with me (and the readers of this blog!). It’s a real treasure. To read more about Rachel’s discovery in New York, click here. 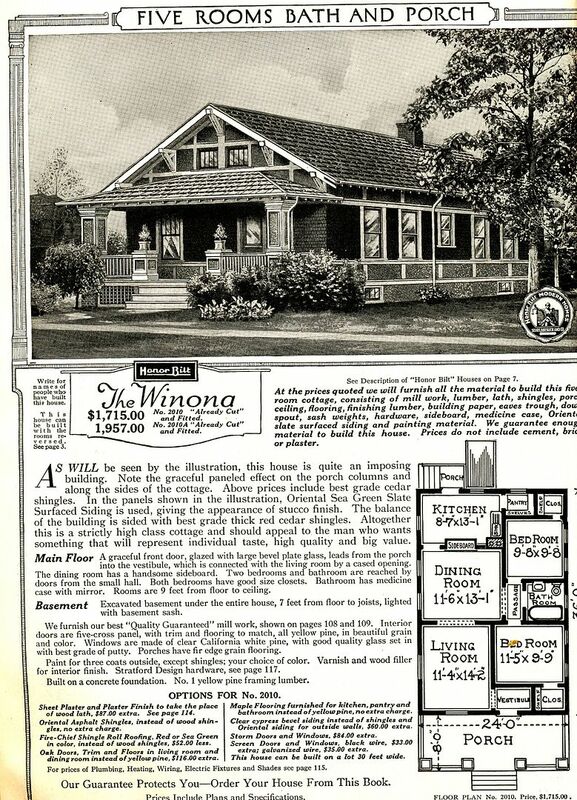 To join our group of Facebook (”Sears Homes”), click here. 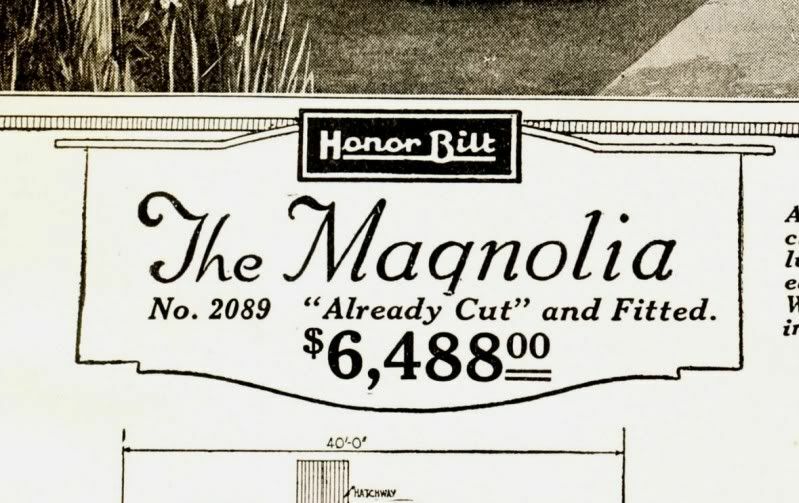 Yesterday, I did a blog about the Sears Concord, and my tired eyes misread some of the fine print in an old Sears Modern Homes catalog. In yesterday's blog, I showed this house, but misread the opposite page (which featured all the testimonials), and placed the wrong text with the photo. Nice house, and look at that porch! 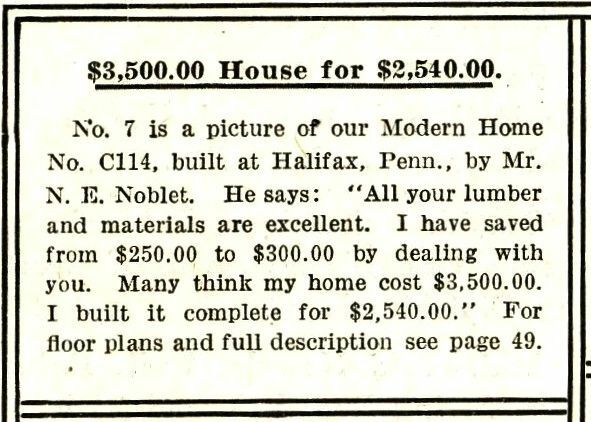 This is the correct text, which shows that the house was built in Monongahela, Pennsylvania. 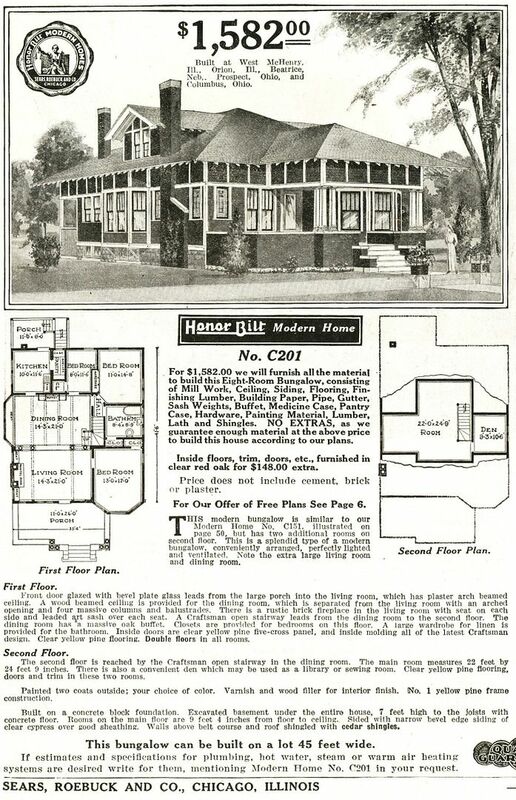 So Sears Modern Home #114 (The Concord) was built in Monongahela, PA (1916 catalog). Side by side comparison shows WHY it's so difficult to identify these houses a century later. 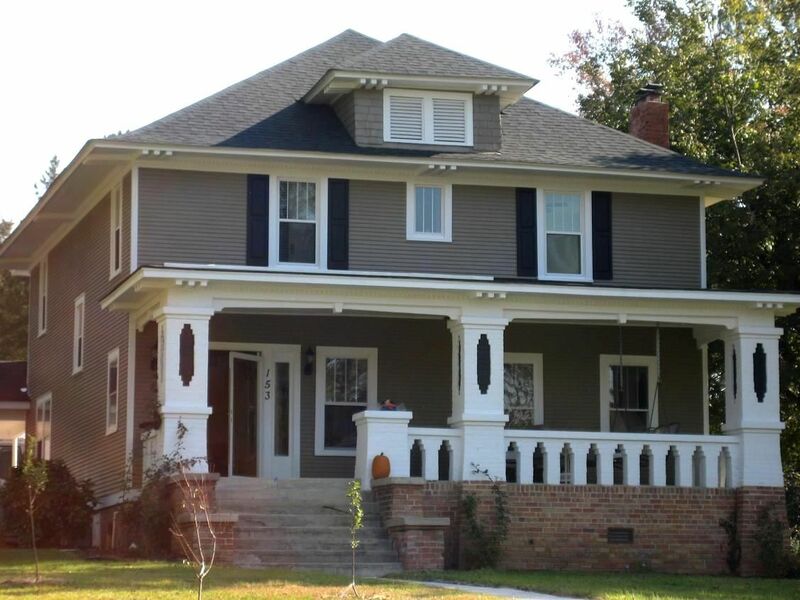 The whole front porch was removed, dramatically altering the look of the house! 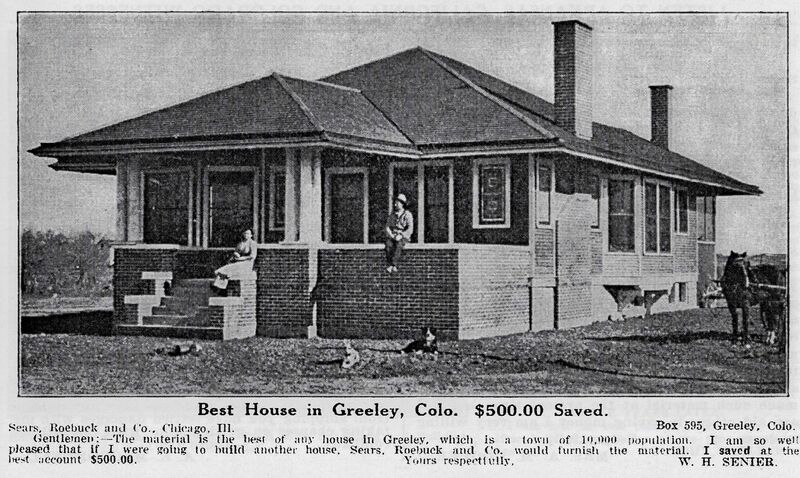 And while we’re on the topic of identifying old Sears Homes, look at this house (below). The corresponding index identifies this as a Sears Model #114 (The Concord) and yet it doesn't really *look* like a Concord. The roof has been raised a significant amount, creating a larger second floor and also creating an entire third floor. 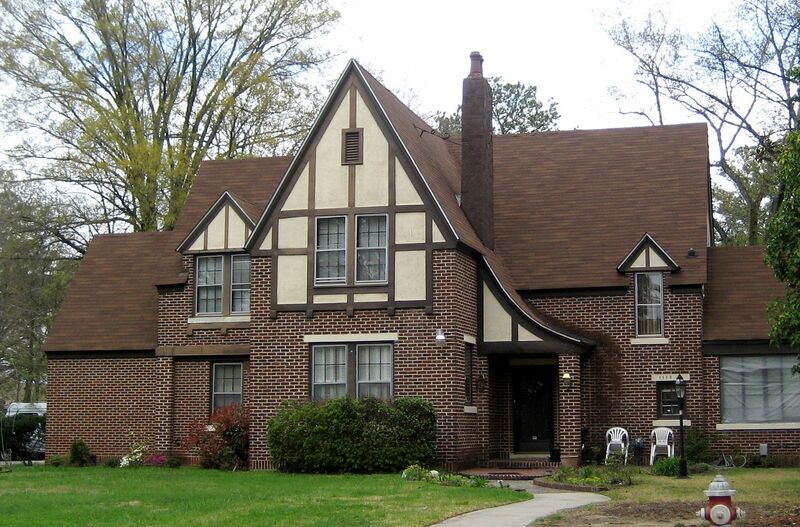 Plus, there's no "cornice dormer" (as with the traditional Concord). In short, this house bears little resemblance to a #114. 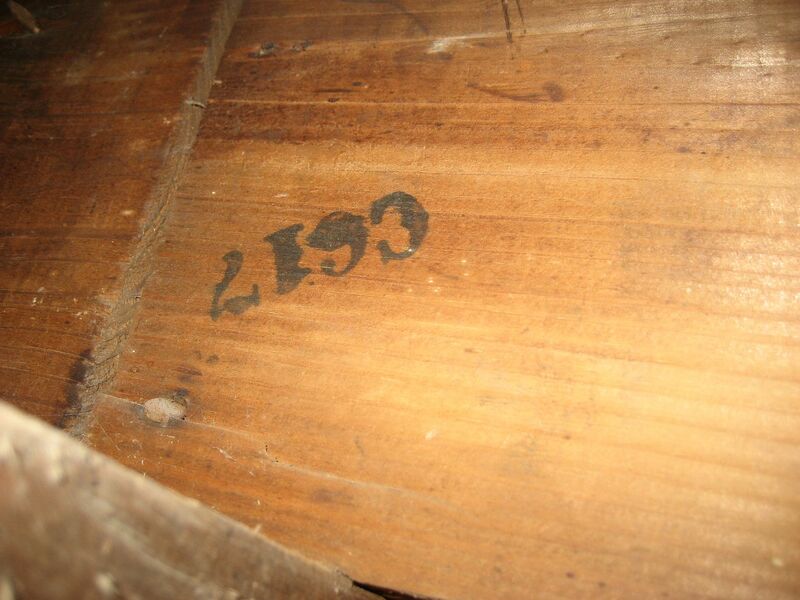 And yet, it's obviously described as a "C114" in the 1916 catalog. So it *is* a Sears Concord. Of special note is the fact that there's no mention of it being a customized design. Click here to see WONDERFUL old photos of a Sears Concord that’s been faithfully and painstakingly restored. When I retrieved old photos from a dead laptop, I wasn’t surprised to find that I had more than 35,000 photos on the hard drive. The great majority of those photos were Sears kit homes. Of those 35,000 photos, I have one photo of a Sears Homart Prefab Home. 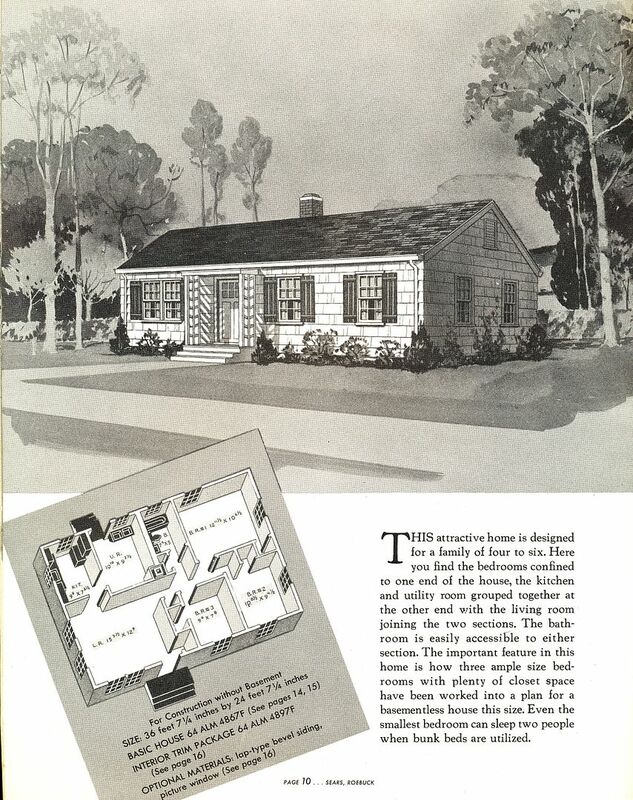 From 1948-1951, Sears sold prefabricated houses known as Homart Homes. 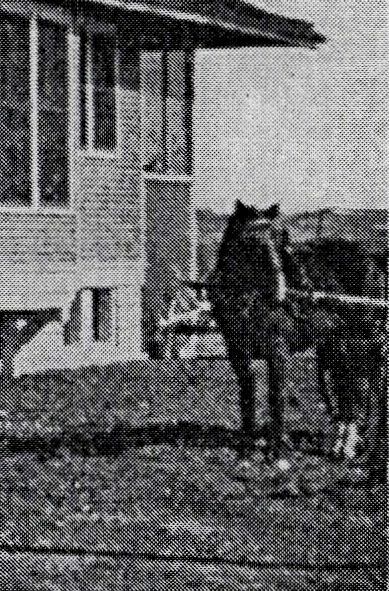 These small houses were shipped by truck (not train) and arrived in sections measuring 4′ by 8′ to 8′ by 8′. 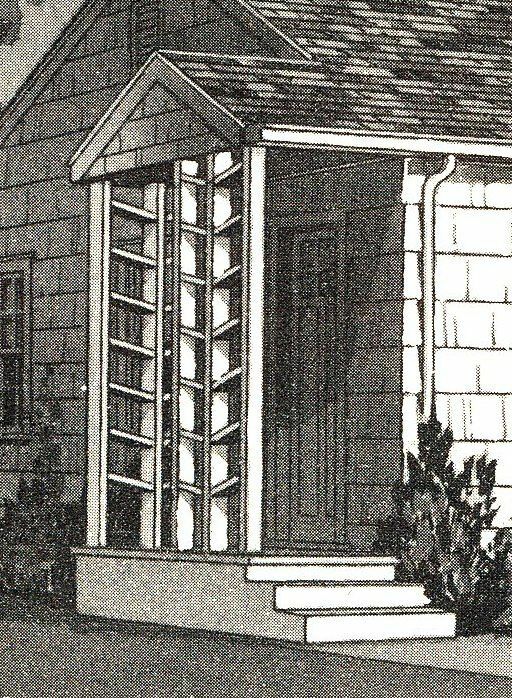 Fasteners were included with these diminutive homes, and the houses were bolted together at the site. They were very modest homes with very simple lines and shallow roofs. Most were 600-850 square feet. 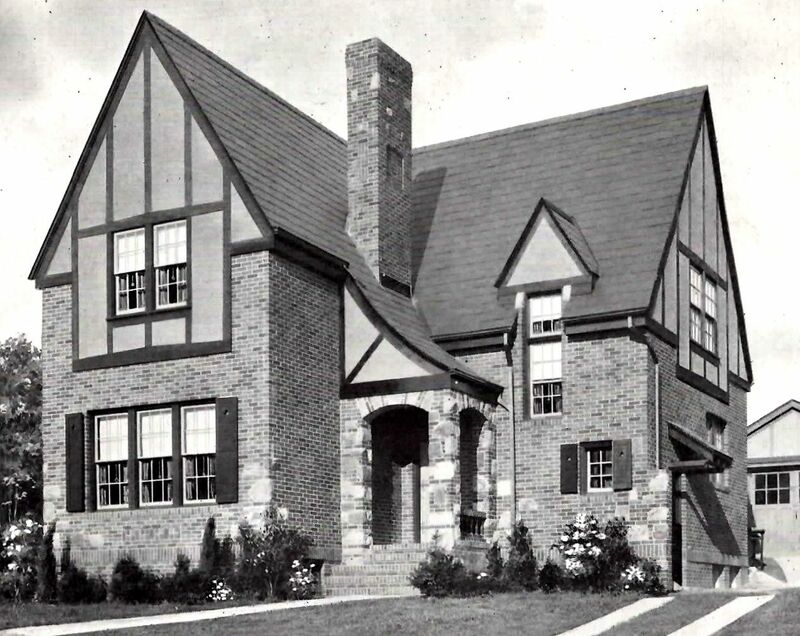 Sears Modern Homes - the kit homes that were sold from 1908-1940 - were not prefab houses. Prefabricated houses are - as the word suggests - prefabricated. In other words, they’re pre-built at a central plant, broken down into sections, and then transported to the building site, where they’re re-assembled, quickly and efficiently. 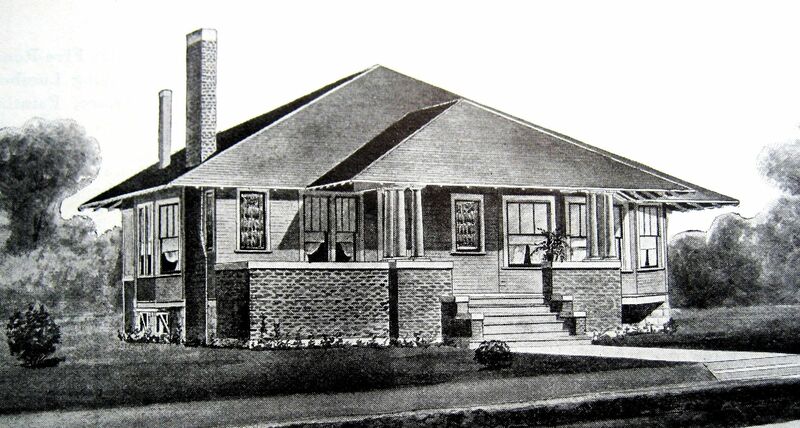 Sears Modern Homes were were true kits, containing 12,000 pieces of house. Each kit came with a 75-page instruction book. They were made with superior quality building materials (#1 southern yellow pine framing members and cypress for everything exterior). 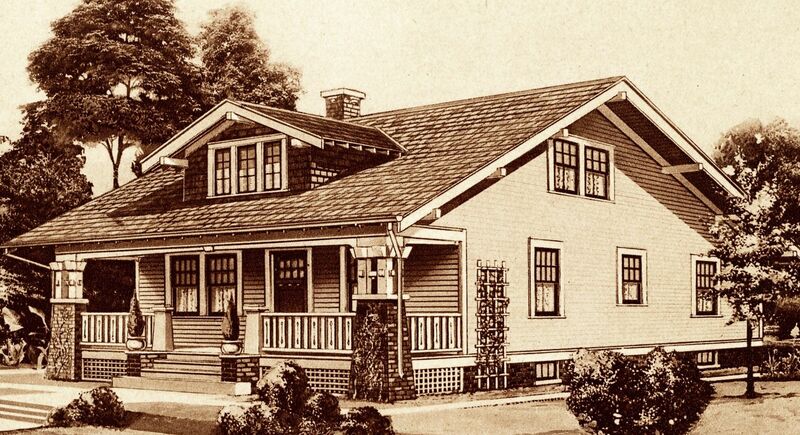 From 1908-1940, about 70,000 Sears Modern Homes were built. 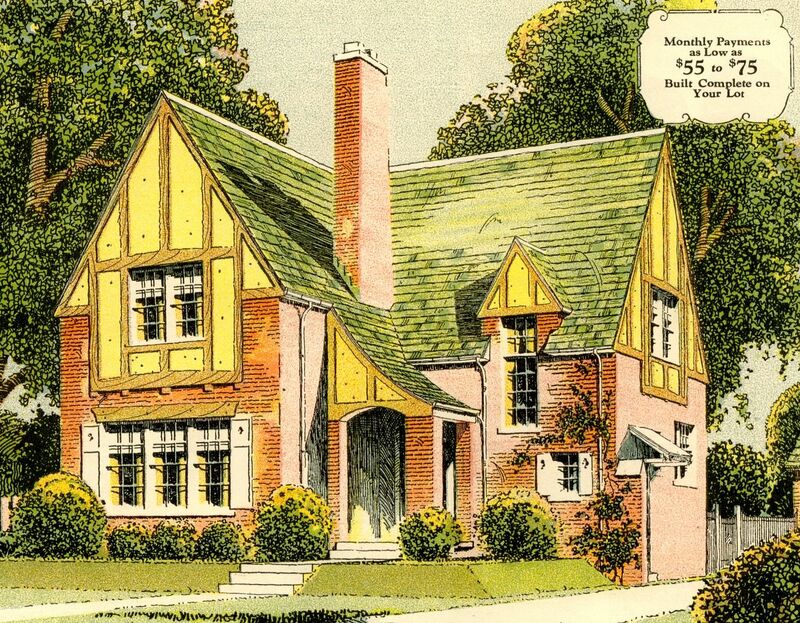 Based on some educated guessing from reading old catalogs, fewer than 3,000 Homart Homes were built. And now I need a little help from my friends. 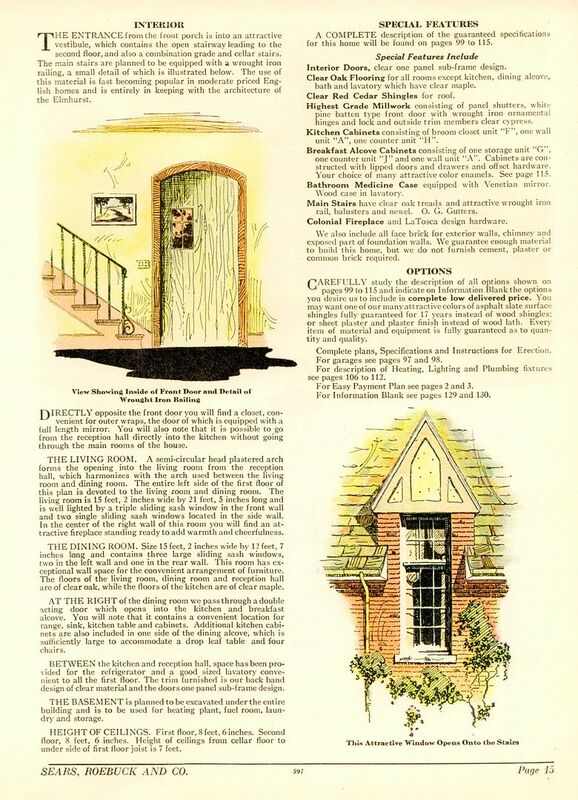 The 1949 Homart Homes catalog lists several addresses where Homart Homes were built. I’d love to have photos of these houses to publish at this site. If you’re so inclined, please get me a photo and send to me? Doing so will launch a veritable wave of good housing karma in your direction. :) The Homart Homes (for which I have specific addresses) are in Illinois, Iowa, Ohio and Wisconsin. Click here to see the specific address of Homart Homes. 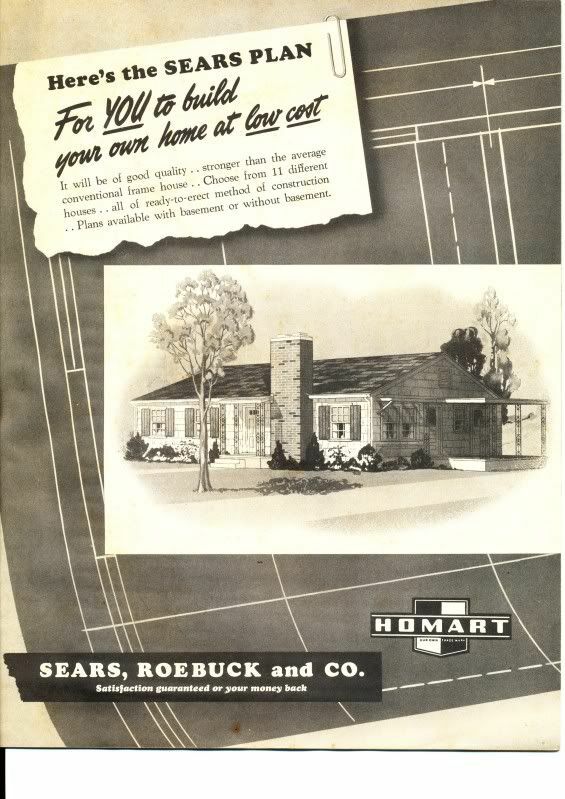 Sears also had a line of hardware and home merchandise (electric fans, water heaters, tools) which bore the name “Homart.” And where did they get that name? In the first decades of the 1900s, Sears headquarters was located in Chicago, at the corner of Homan and Arthington Street. Homart is a combination of those two street names. 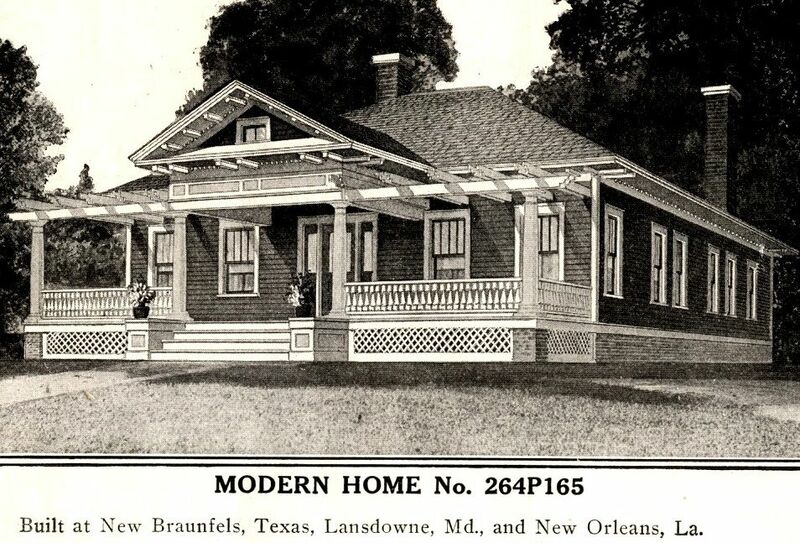 To see pictures of Sears Modern Homes, click here. 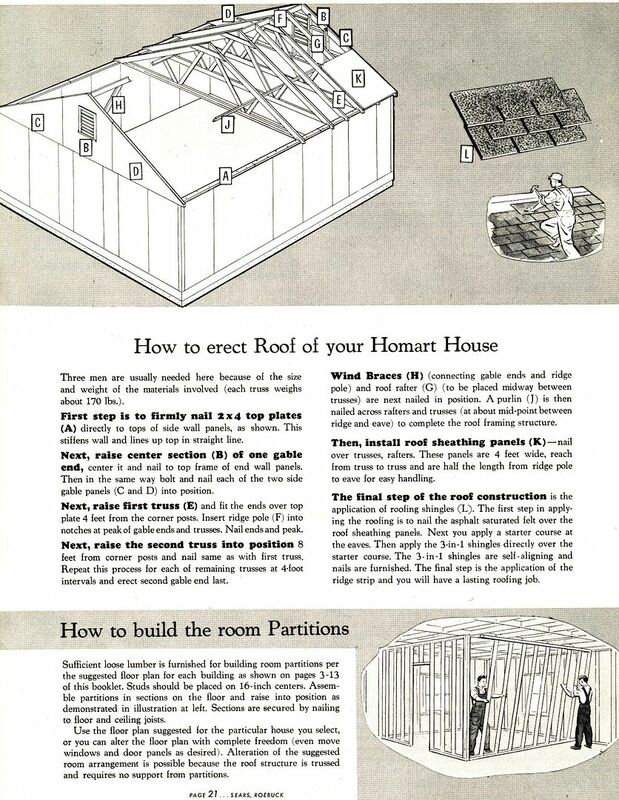 Homart Homes were very modest prefab homes offered after WW2. Today, it's nearly impossible to find these houses, because they were so plain and in subsequent years, most have been covered with substitute sidings. 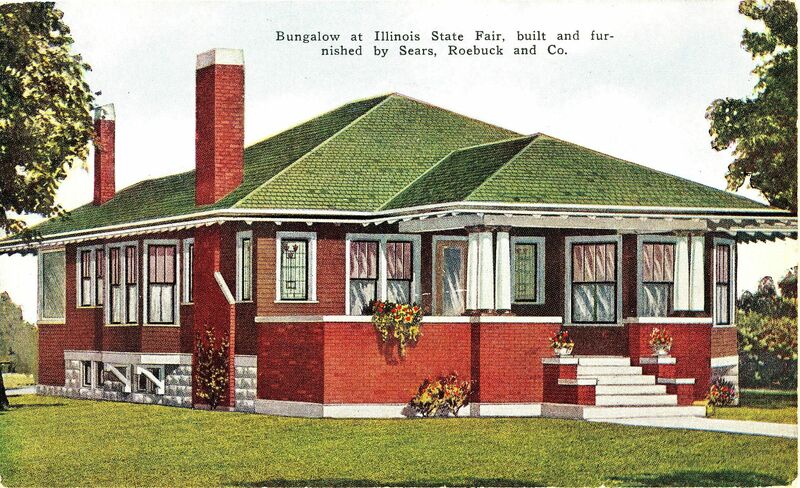 In the catalog shown above, there were several addresses of known Homart Homes in Illinois. 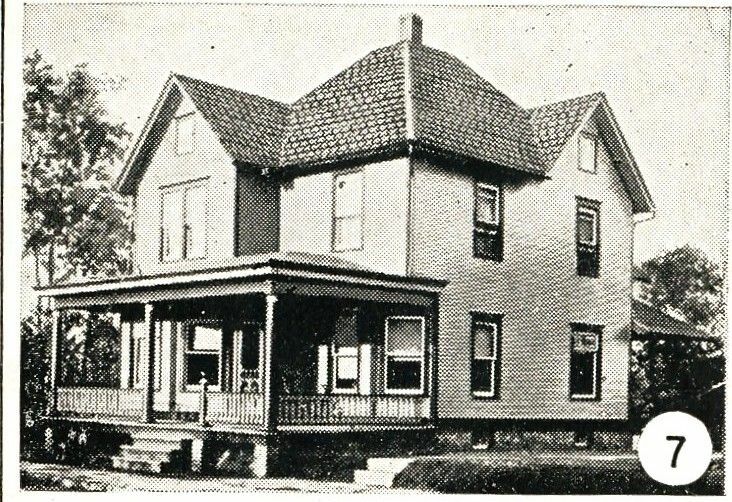 This house (in Monmouth, IL) was listed in the catalog as a Homart Home. Thanks to Carol Parrish for sending in this photo! For the most part, these were very modest homes. 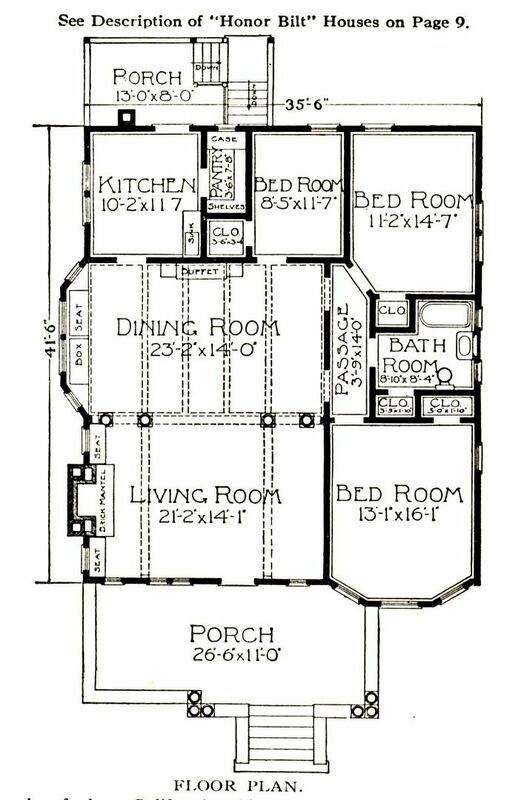 Look at the size of the rooms in this first house! This was their most spacious Homart Home, but you can see from the photo below, this is also a pretty modest house. One of the bedrooms is 7 feet by 9 feet. As long as Junior never outgrows his crib, this should work just fine. 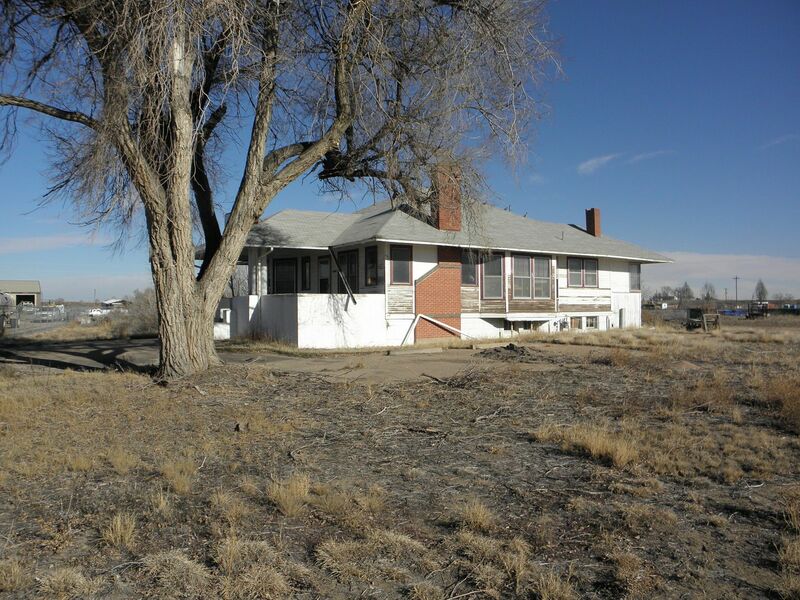 This was the largest Homart Home offered in the 1950 catalog, and it's not very big at all. Close-up shows that these Homarts were well-constructed homes. Homart Homes arrived in sections, which were bolted together. The houses were not wholly prefabricated and pre-built. A significant bit of onsite building was required. 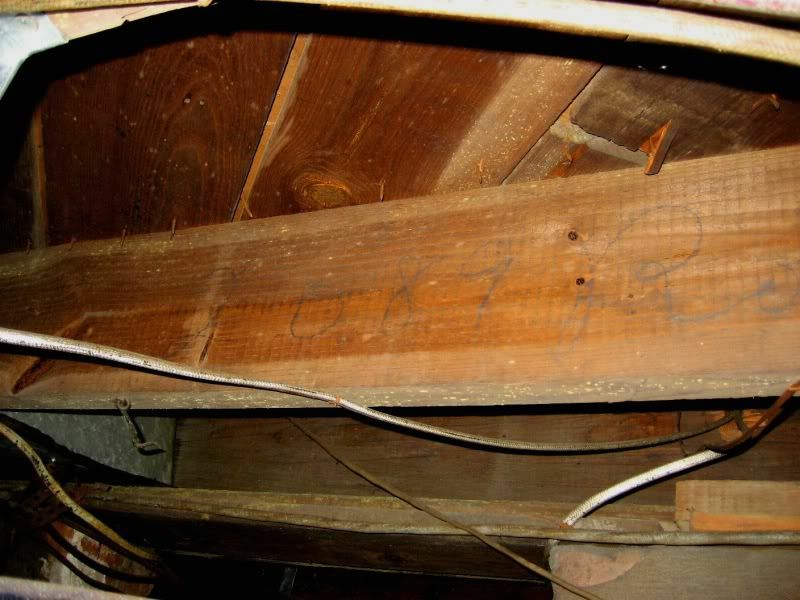 Roof trusses were pre-built in Homart Homes, and walls arrived in sections. Lap siding covered the sectioned walls, hiding the home's prefab origins. 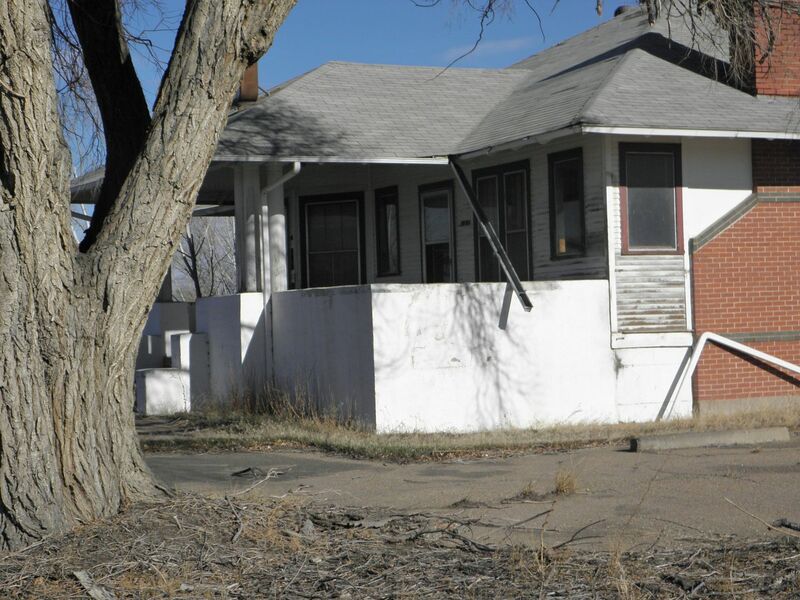 These porches could be a clue in identifying Homart Homes. 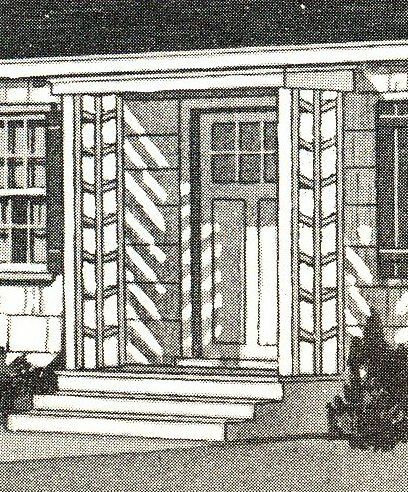 Every Homart Home offered in the 1950 catalog had this unique configuration on the front stoop. 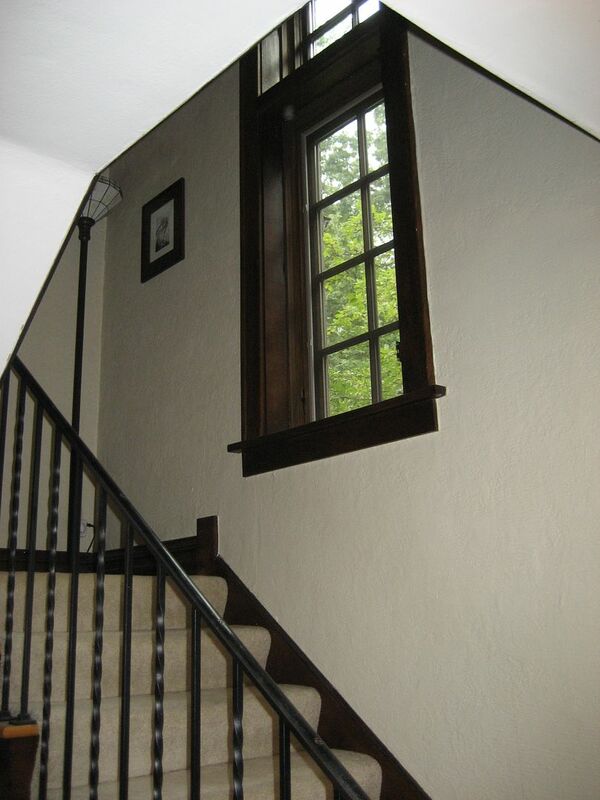 A variation of that unique woodwork around the stoop. An old Sears Homart (prefab house) sits on the edges of the city, not far from the Sears Mill in Cairo, IL. 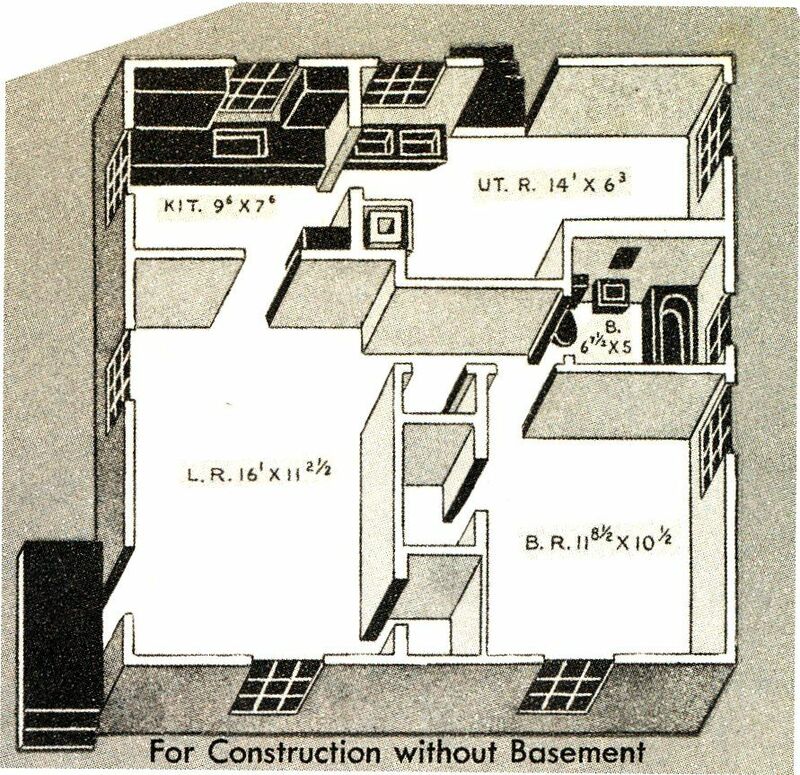 Homart Homes were post-WW2 Sears Homes that were shipped out in sections, which were then bolted together at the building site. 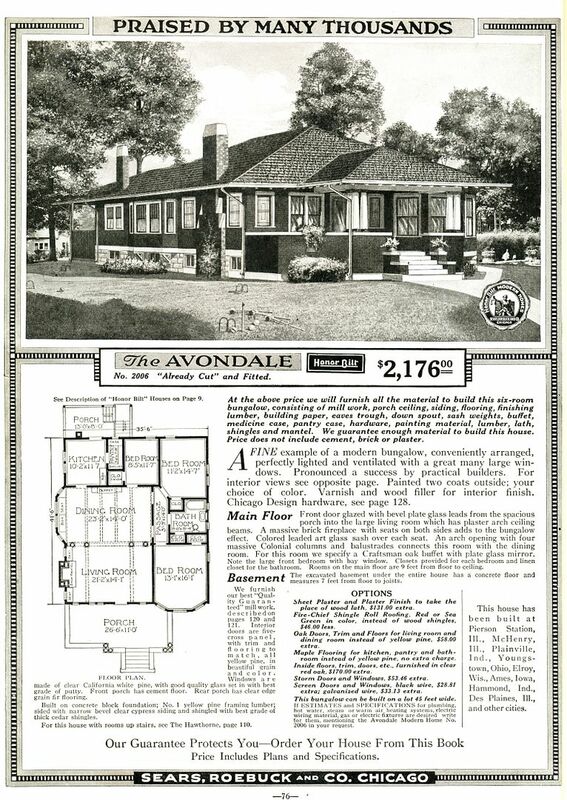 These were radically different from "Sears Modern Homes" which were pre-cut kit homes. And usually, they just don't "age" as well as the sturdier "Modern Homes" (Honor Bilt homes). 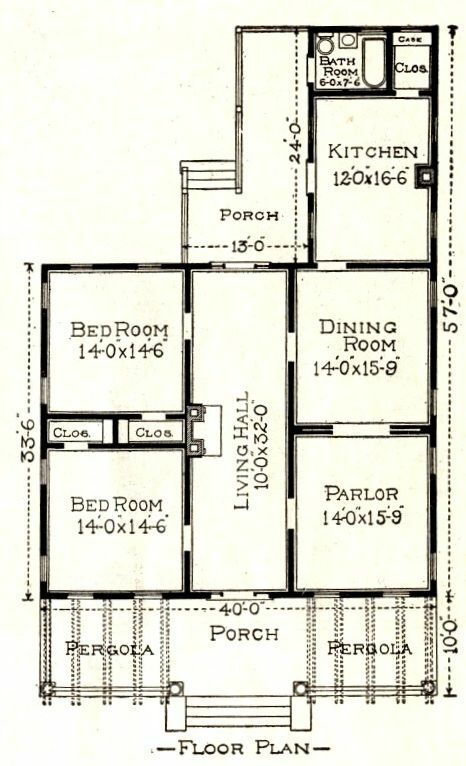 Sears Modern Homes - the kit homes that were sold from 1908-1940 - were not (emphasis on NOT) prefab houses. Prefabricated houses are - as the word suggests - prefabricated. In other words, they’re pre-built at a central plant, broken down and then transported to the building site, where they’re re-assembled, quickly and efficiently in sections. 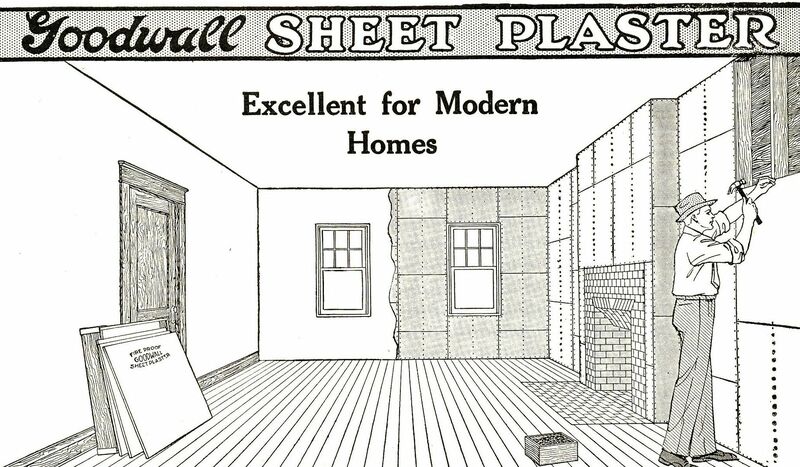 Sears Modern Homes were kit homes, and there is a big difference. 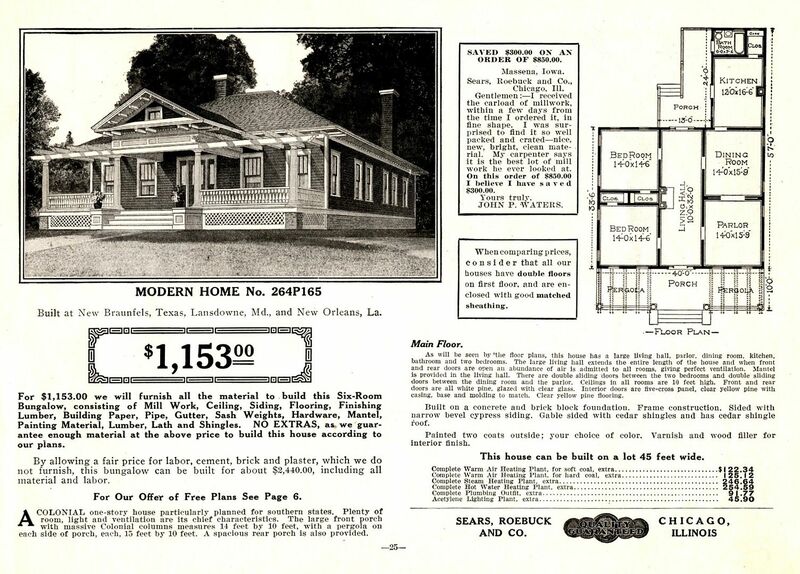 Sears Modern Homes were 12,000 piece kits and came with a 75-page instruction book. 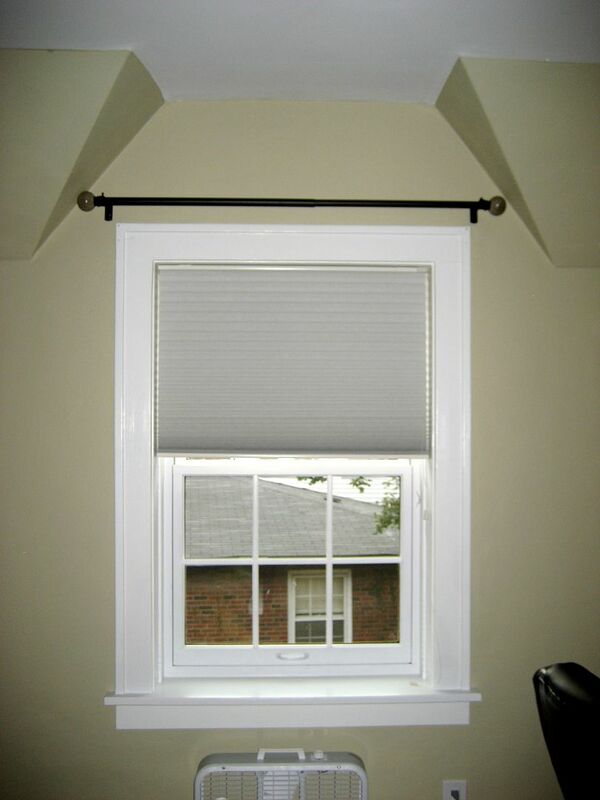 They were made with superior quality building materials (#1 southern yellow pine framing members and cypress for everything exterior). 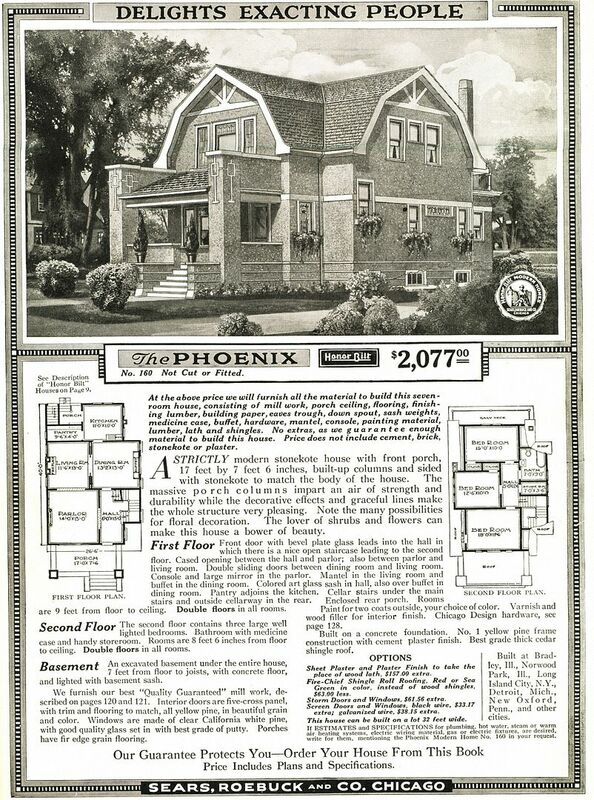 You can read more about Sears kit homes here. And then there’s Homart Homes. 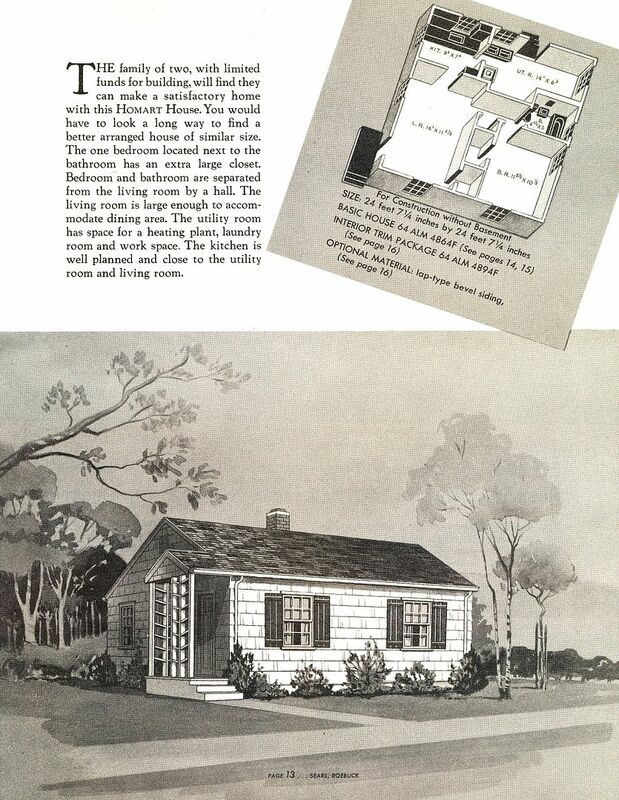 From 1948-1951, Sears sold prefabricated houses known as Homart Homes. These houses were shipped in sections. The walls came in sections of 4′ by 8′ to 8′ by 8′ and were shipped by truck. 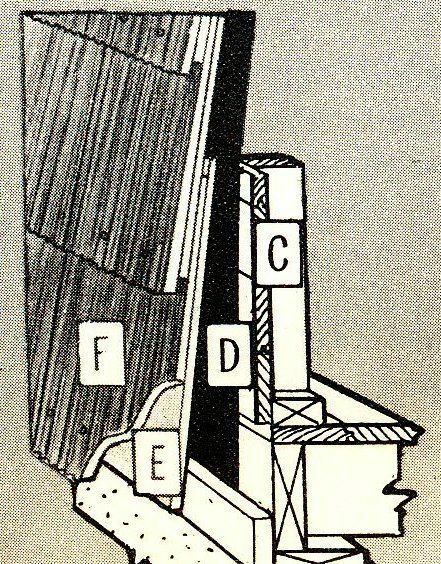 Fasteners came with these diminutive homes, and the houses were bolted together at the site. They were very modest homes with very simple lines and shallow roofs. Most were 600-850 square feet. 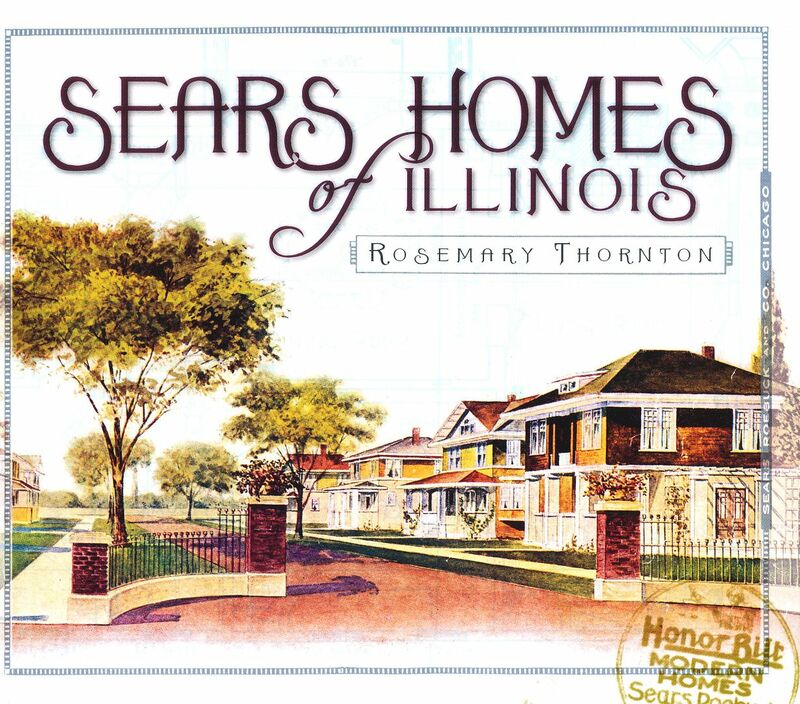 Sears also sold a line of hardware and home merchandise (electric fans, water heaters, tools) which bore the brand name “Homart.” In the first decades of the 1900s, Sears headquarters was located in Chicago, at the corner of Homan and Arthington Street. Homart is a combination of those two street names. 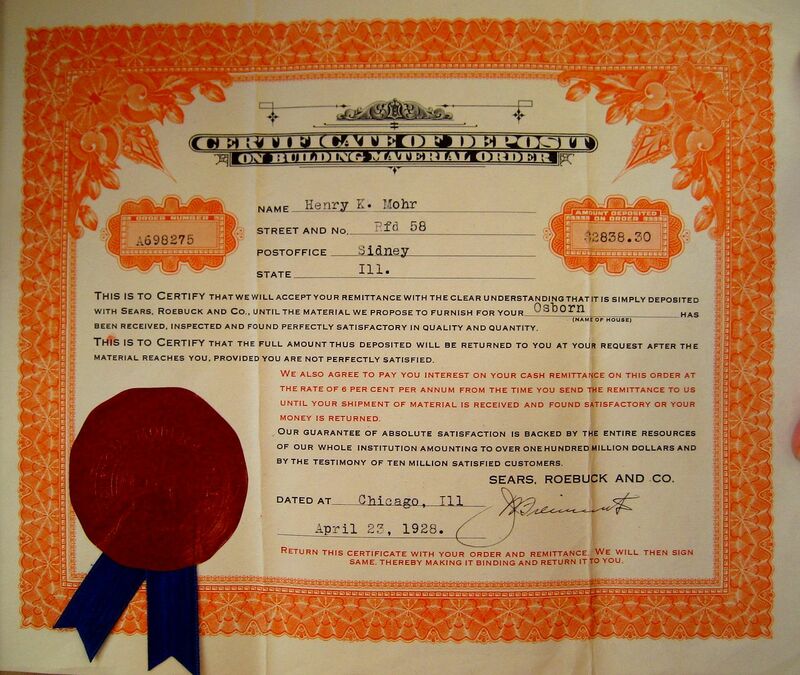 To see pictures of Sears Homes, click here. 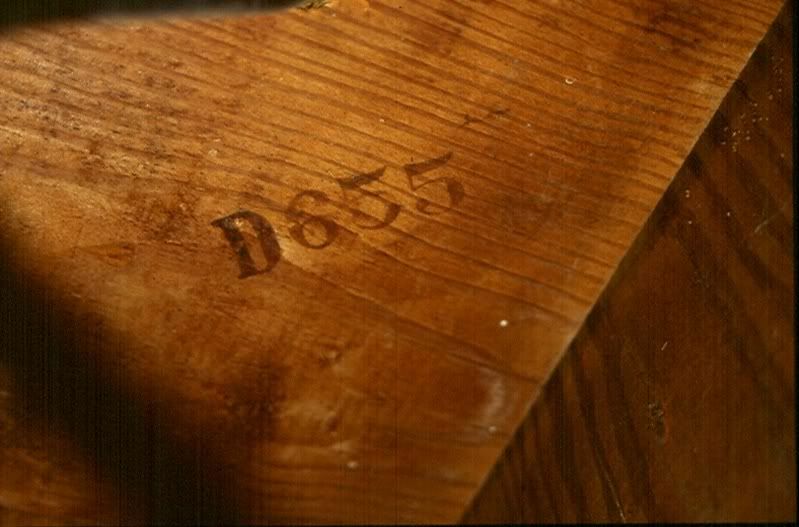 Plumbing fixtures - such as this bathtub - can provide clues, as well. 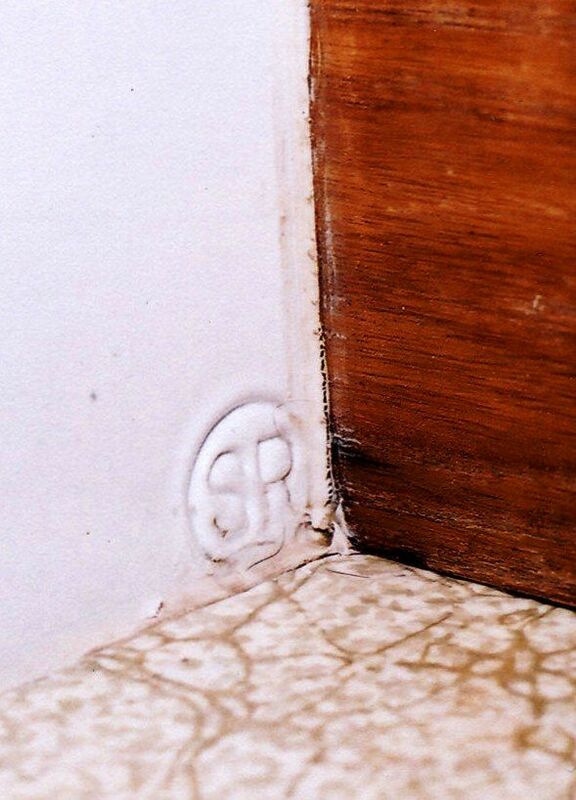 I've found this "SR" (Sears Roebuck) stamp on bathtubs, sinks and toilets. On the sink, it's found on the underside, and on toilets, it's found in the tank, near the casting date.